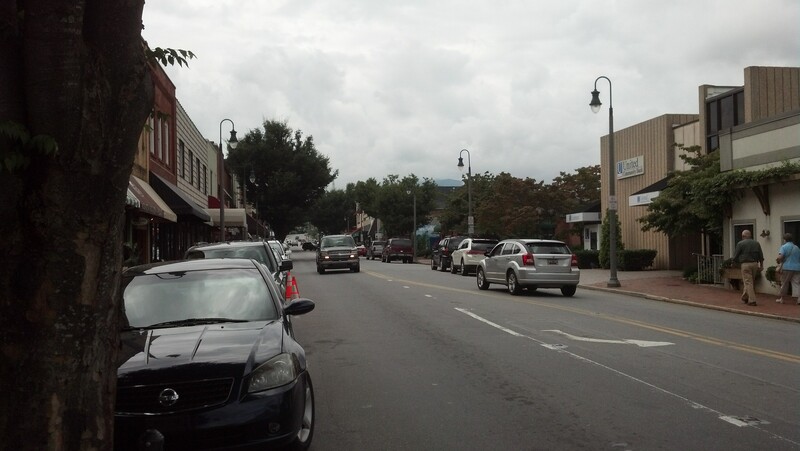 In my “Prologue” to this group of posts I wrote about Waynesville, North Carolina. As I read that post again, I realized I’d poured my heart into it and wouldn’t change a word. Here is that text again. Waynesville is the county-seat of Haywood County. 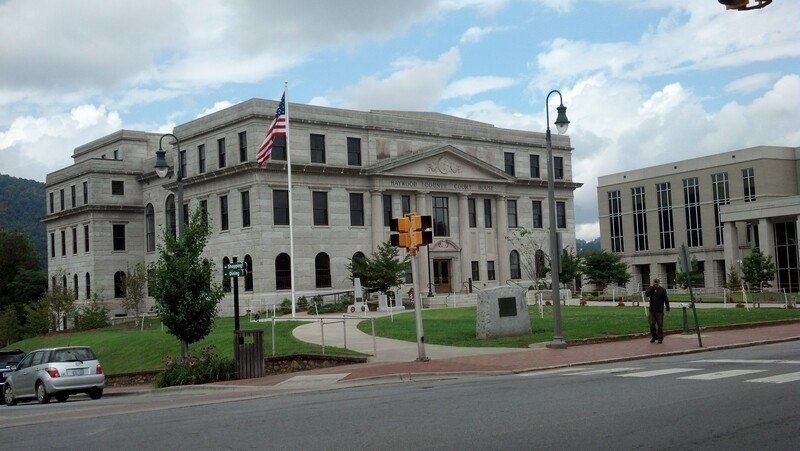 The courthouse is right on Main Street. Main Street has changed quite a lot since we had our home in Waynesville. Most of the storefronts are still the same, but the change is in what’s inside. I was afraid that I would find the loss of the stores I used to visit hard to accept. I was wrong. 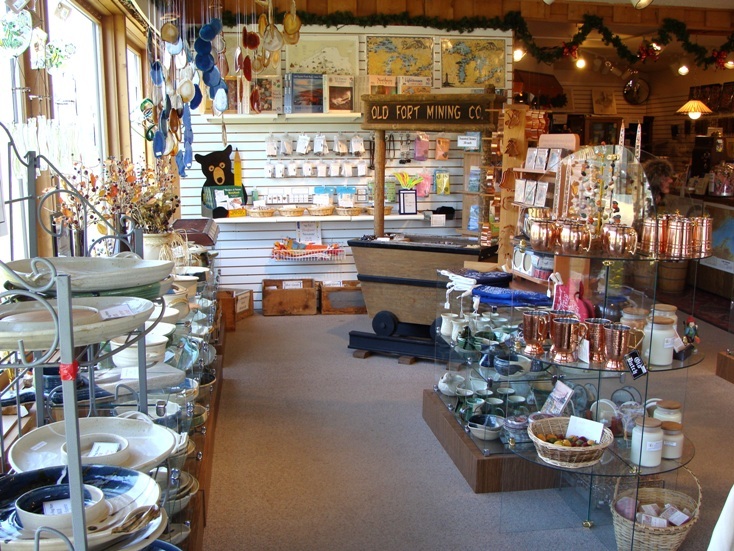 Main Street, now, has some beautiful stores with artisan-quality goods. There are galleries of all kinds. 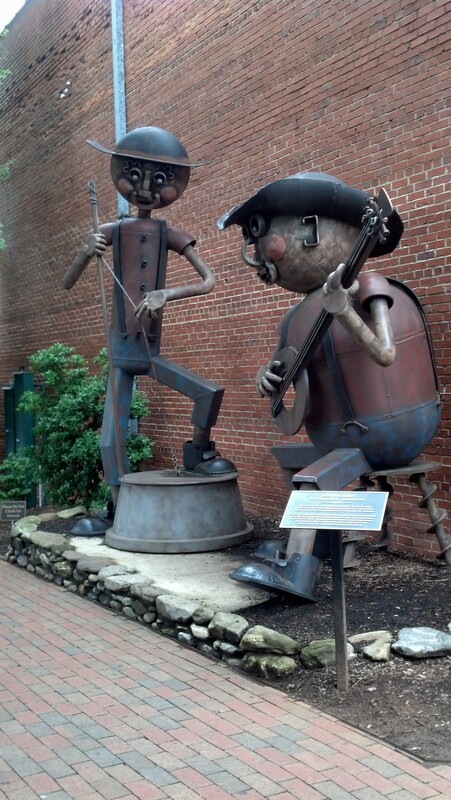 Some world-class artists now call Waynesville home. There are also restaurants, chocolate shops, and clothing stores. Several real estate agents have offices on Main, as well as several attorneys’ offices. 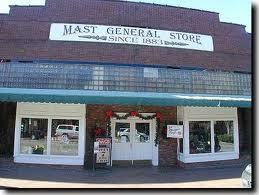 Mast General Store (one of several in North Carolina) is also on Main. 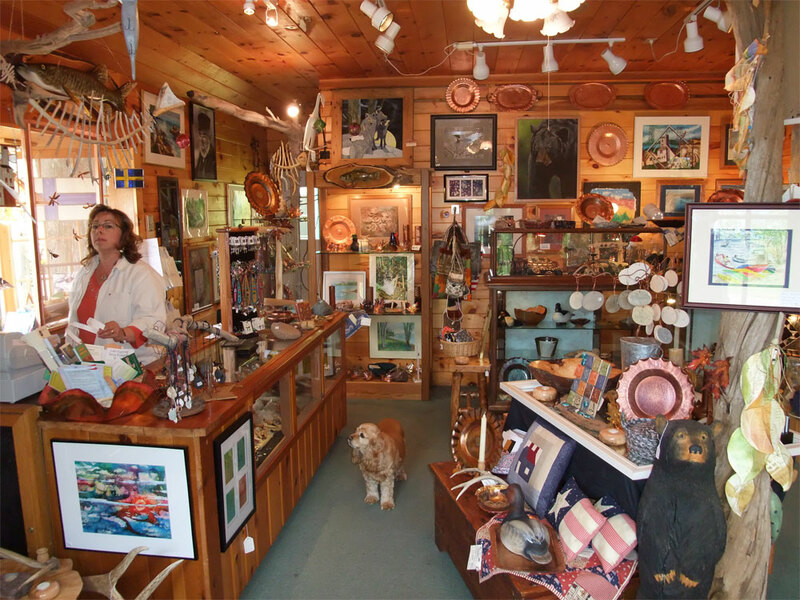 Mast has a little of everything – clothing, shoes, housewares, furnishings, food, and the largest selection of old-time candy found anywhere. I think the biggest surprise for me was that there are now three active breweries in Waynesville! 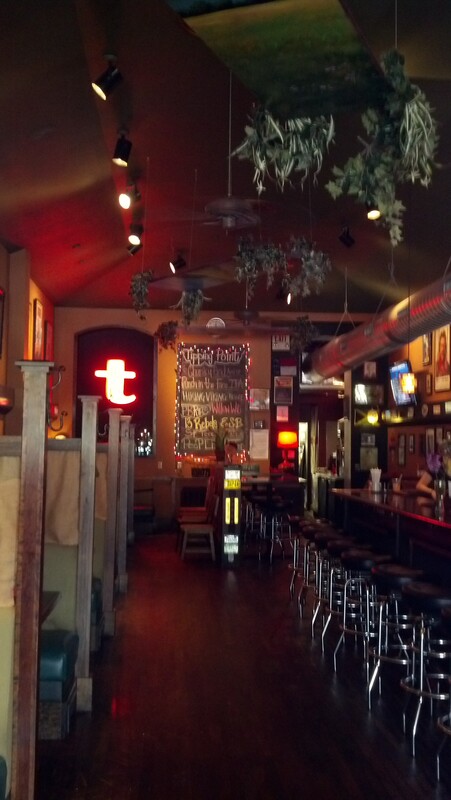 We visited Tipping Point Tavern, but there are also Headwaters Brewing and Frog’s Leap Public House. Those two we will check out on our next visit. We had both a lunch and a dinner at Tipping Point Tavern. Lunch was quite enjoyable. The food was quite good – can’t say “great” with regard to sandwiches and beer, but very good. We started with the beer-battered jalapeno poppers which were hot from the fryer and had very good flavor. I had the Tavern Reuben and really enjoyed it. Jim had Fish Tacos. I must say, you really shouldn’t be leaving Tipping Point hungry! They don’t skimp on portions! Dinner was something of a different story. We had planned to go to The Bourbon Barrel, but they weren’t interested in seating us – even though there were many open tables. I guess that’s a place for locals only. Out-of-towners need not darken their doors. So… we ended up back at Tipping Point Tavern. Yes, the portions were huge (especially the Pulled Pork Burrito)! What was really off-putting was the noise level. We were there on a Wednesday night, so we didn’t expect the crush of people or the noise. Obviously, this is the place for the younger crowd to meet for drinks after work. If we’d been there just for a beer or cocktails (and had been several years younger), we probably would have had a wonderful time. For dinner, well it was rather hard to enjoy ourselves. If you go, it’s probably wise to stick to lunch, or go for their terrific beer and after-work party. Now for the best meal of our entire trip. 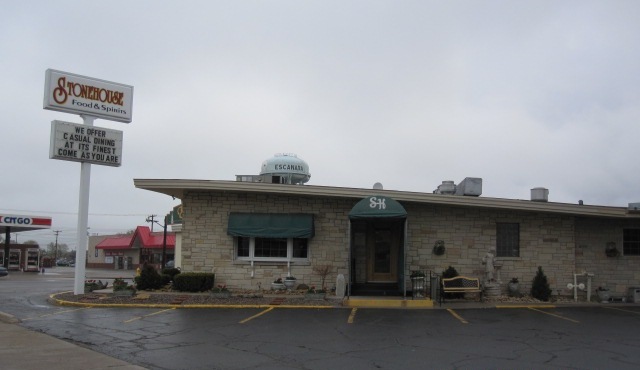 It was at The Sweet Onion restaurant on Miller Street. 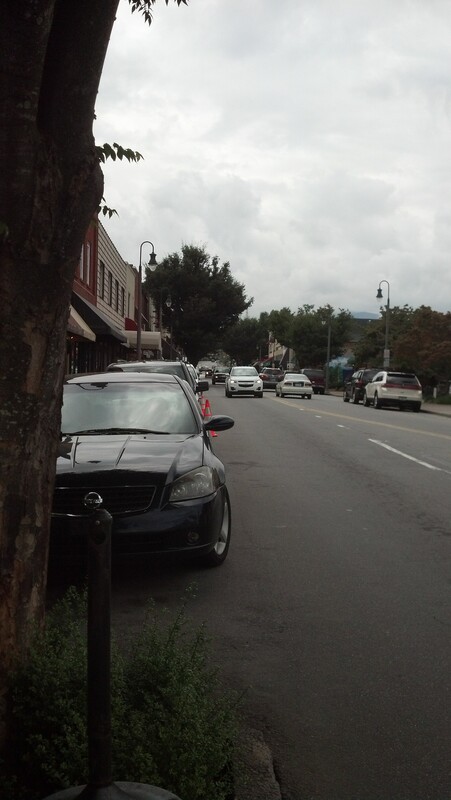 This restaurant would be at home in any large city in the U.S, but it’s nestled in beautiful, downtown Waynesville, NC. We had been told by the innkeepers at our bed & breakfast (Andon-Reid) – complete review in a dedicated post coming – that reservations were strongly suggested, so they made them for us. 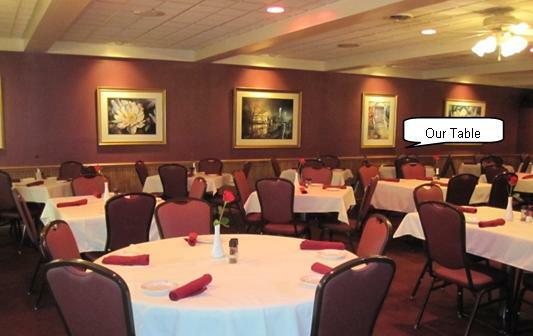 This lovely restaurant was bustling and after our experience, I understand why. The service was superb. We were warmly welcomed and shown to a comfortable table next to the window. Our server took our beverage order and gave us a couple of minutes to take-in the menu. What a menu! It was incredibly hard to decide. We settled on splitting the crab cake appetizer. This was chock-full of lump crab loosely bound and served with a terrific lemon-basil aioli. Our entrees were amazing. Jim had the Blackberry BBQ Short Ribs. He proclaimed that they were the best he’d ever had. They were fall-off-the bone tender and the sauce was incredible. I had the Shrimp & Grits. Now, these are no ordinary shrimp and grits! The white cheddar grits were topped with huge, perfectly-cooked shrimp and big pieces of bacon. On top of all that lusciousness, there was a delicate, yet flavorful, lobster cream sauce. Heavenly! I even got one of my all-time favorite sides with this entrée. Marinated Cucumber and Tomato Salad is one of the food items I most closely associate with my Aunt Jean (who grew up in Waynesville). To have this on the menu, and on my plate, brought me nostalgically home with her. Dessert wasn’t necessary; but, then again, we were on vacation. We decided to splurge on splitting an amazing crème brulee. It was absolutely perfect. It was creamy and soul-satisfying, yet light enough to leave us comfortable. All in all, one of the best meals either of us had ever had. If you are going to be in Waynesville for any length of time, I highly recommend you make plans to have at least one dinner at Sweet Onion. You won’t be sorry. 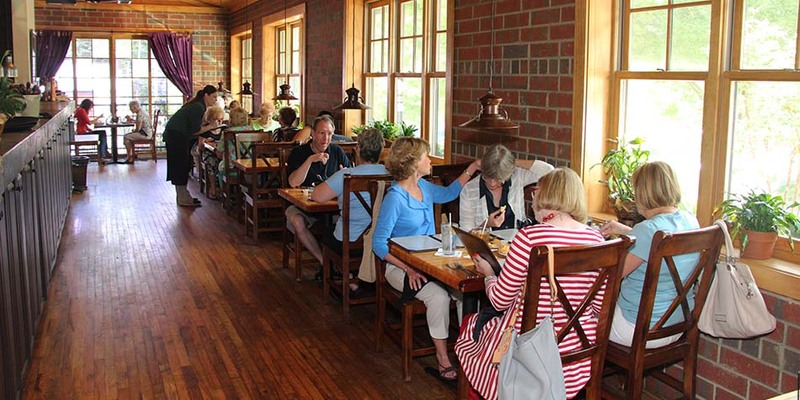 After enjoying a sumptuous breakfast at Oakland Cottage, we were off to explore Asheville. 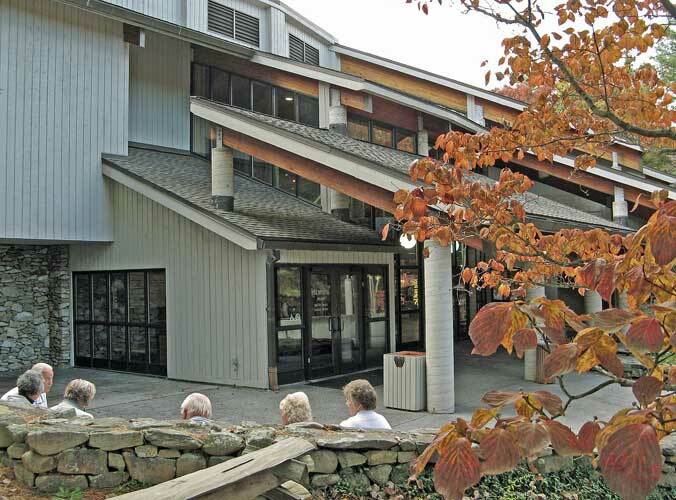 Our first stop was the Allanstand Craft Shop at the Folk Art Center (Milepost 382 Blue Ridge Parkway). It was raining (as usual) when we arrived, so I didn’t get to take photos of the outside. Once, inside, photos were forbidden, so I won’t be able to share with you. I do understand why no photos are allowed as there could be some who would profit at the expense of the artisans who display and sell their goods here. The photo below is from their website (http://www.southernhighlandguild.org/pages/guild-shops/allanstand-craft-shop.php). I was particularly excited by the stained glass art there. Unfortunately, it was priced appropriately for the work and that was beyond my pocketbook. As a dabbler in the medium, I was thrilled to see such innovation, and it gave me renewed interest in seeing what I could do with the ideas I got from the work in the shop. Other crafts included beautiful pottery, unique glasswork, jewelry, needle arts, woodworking/carving, and painting among many others. So many talented individuals make up the Guild. The volunteers who man the shop are so nice and welcoming. 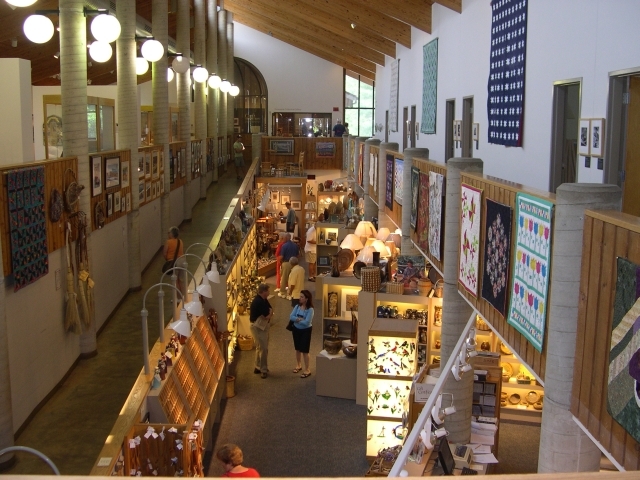 I really recommend a visit to the Folk Art Center if you are on the Parkway, or to any of the other locations (see the website for locations and hours). We’ve been in four of the shops and each one is unique and carries art from the 200+ guild members. 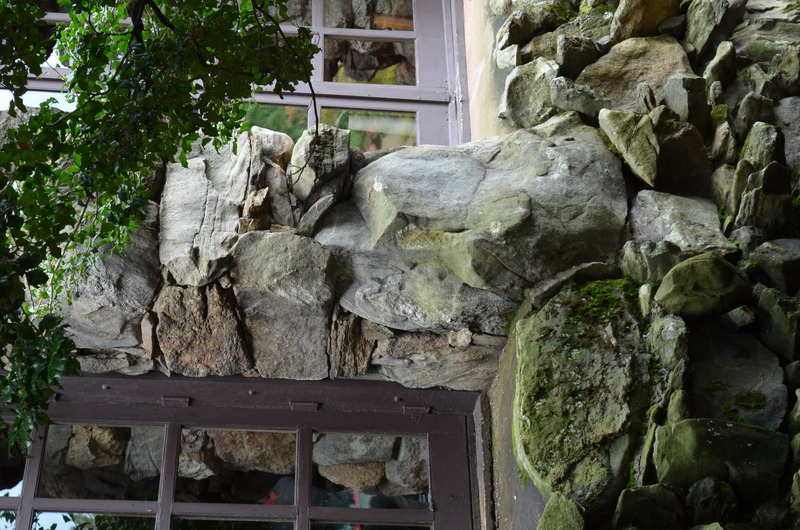 From the Folk Art Center, we were off to explore The Grove Park Inn. This is a destination I’d been wanting to experience for a long time. 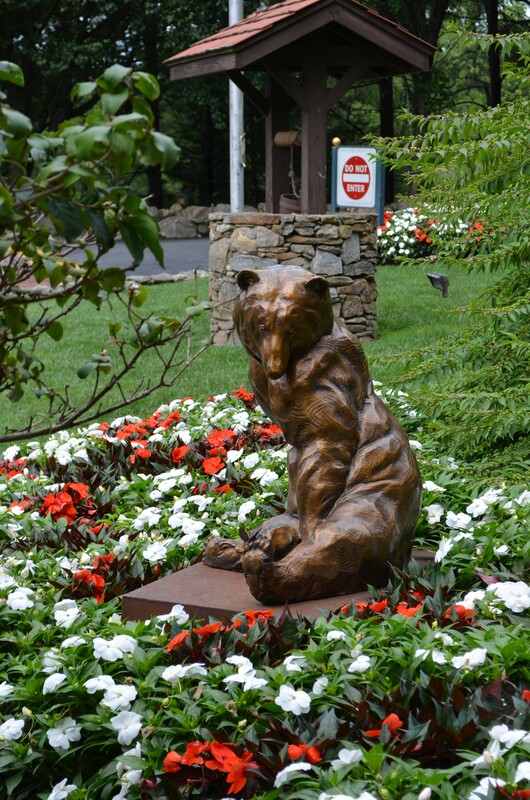 As I mentioned in earlier posts, I’ve been in the Asheville area many, many times over the years; however, never had I been to The Grove Park Inn. Our friends, Eric and Gloria, confirmed that this was a destination that must be experienced. I was always fascinated by the story of the Grove Park Inn. There seems to be so many tie-ins with my own, personal history. No, I’m certainly not related to Edwin Grove or his son-in-law, Fred Seely, but their lives were lived in and around many of the same locations as mine. 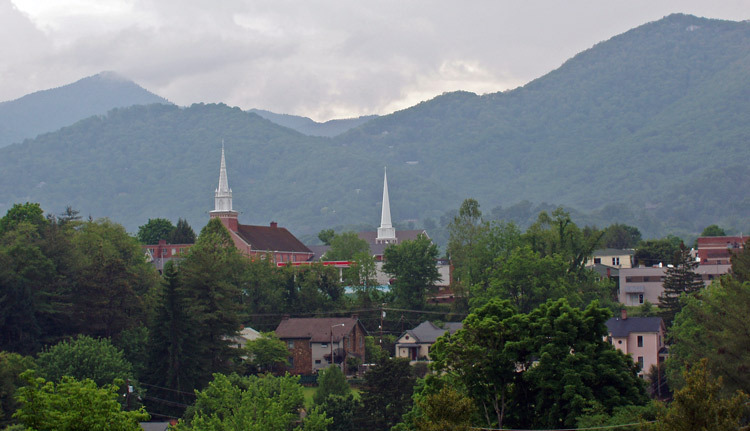 Grove was born, and began his pharmaceutical fortune in Tennessee until doctors told him to seek the fresh air of Asheville. He also was a real estate developer in Atlanta (my home for over 20 years). He purchased the land on which the Grove Park sits around the same time as George Vanderbilt was building his famous mansion. Fred Seely was a pharmaceutical pioneer whom Grove met in Detroit (my current home area). Seely married Grove’s daughter, and the two men planned and built the Inn which opened in 1913. 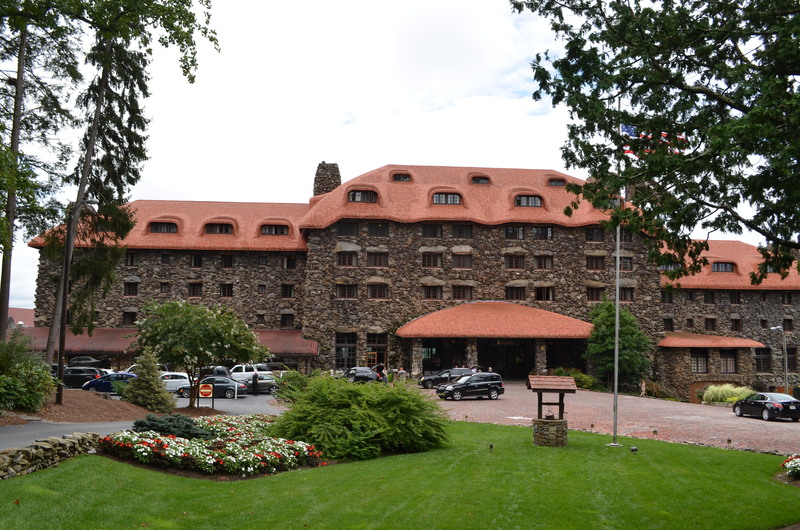 Today, it is part of the Omni hotel system, but it maintains its timeless elegance and incomparable position overlooking Asheville. One of the nice touches is the presence of the many rocking chairs in front of the Inn. It’s a nice place to wait for your car – or to just sit and wait for the rest of your party to arrive. While sitting and rocking, one can enjoy the massive brass and art-glass lamps, the pretty flowers, and the cute bear & butterfly statue. 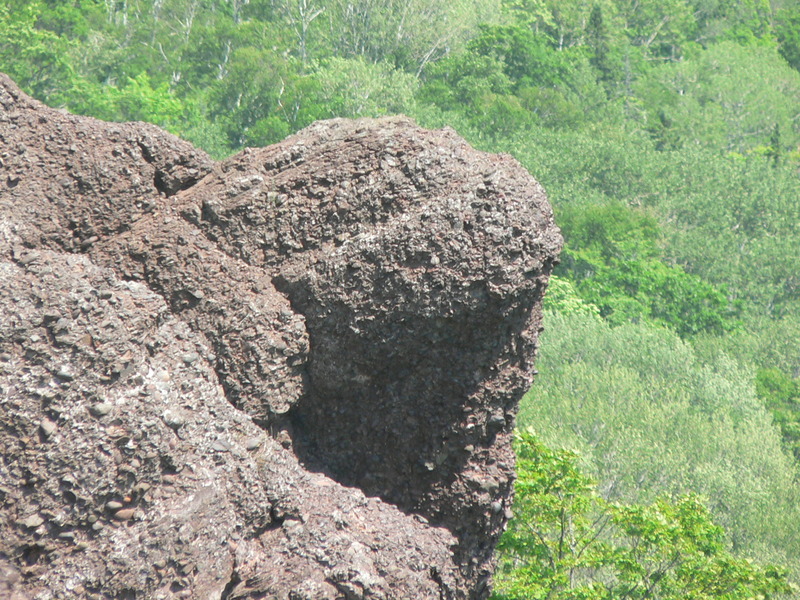 I enjoyed making “rock pictures.” I think the one below looks like a bear. Do you see it? Do You See a Bear? 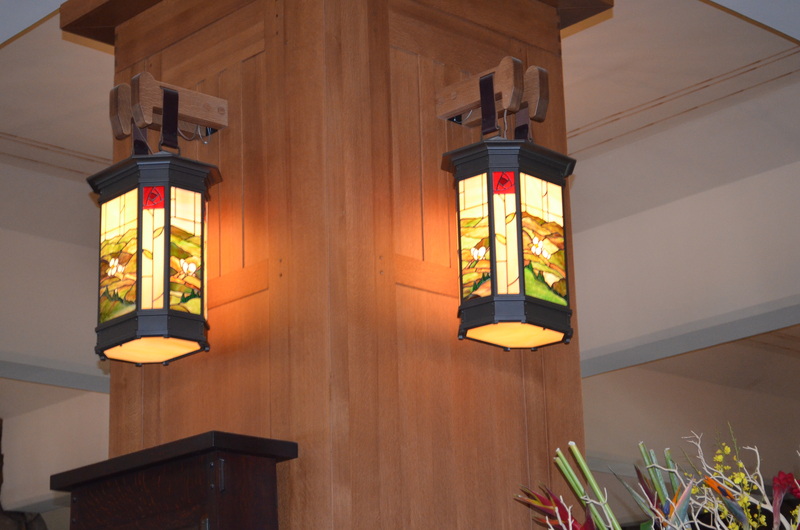 The Arts and Crafts movement is beautifully on display in the Grove Park. Everywhere we looked, there were masterpieces of stone, glass, wooden furniture, and space. 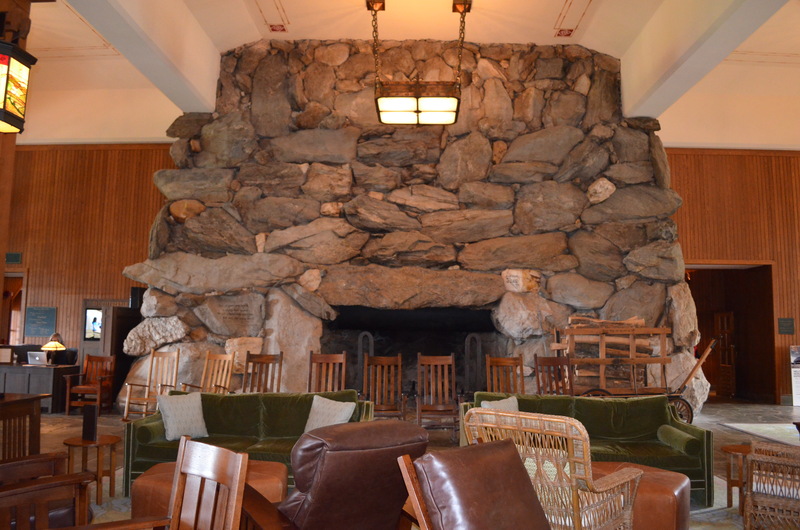 The fireplaces on either end of the lobby are massive! I believe they are every bit as big as the one in the Biltmore. A six-foot-plus tall man can stand in the opening and still be dwarfed. The stacked rocks are magnificent. I could imagine how cozy it must be to sit in a comfy chair in front of one of these fireplaces when winter is raging outside. 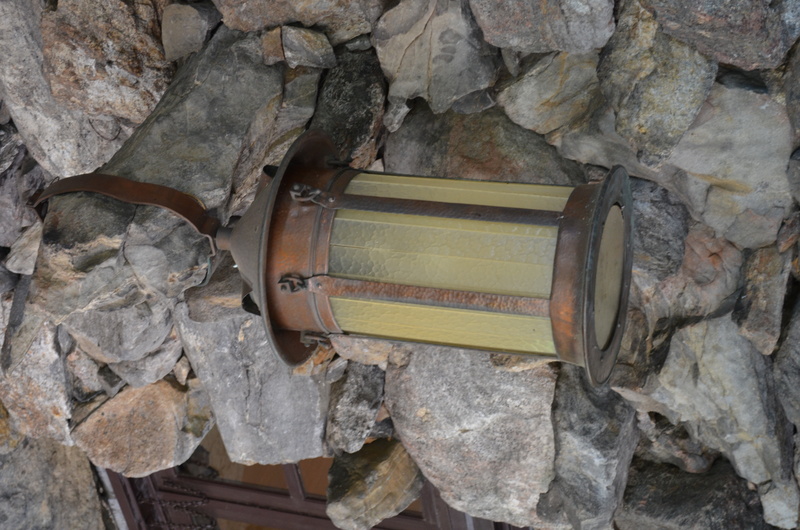 All of the fixtures and furnishings are kept completely true to the period in which the structure was built. As beautiful as the interior is, it doesn’t detract, even slightly, from the amazing view. 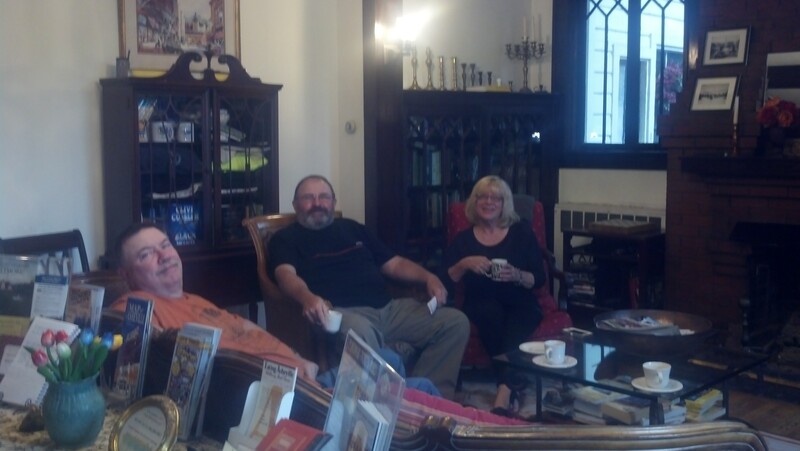 We were there on a gray, rainy day, and even that couldn’t spoil the enjoyment of the Inn. We had lunch on the Sunset Terrace. 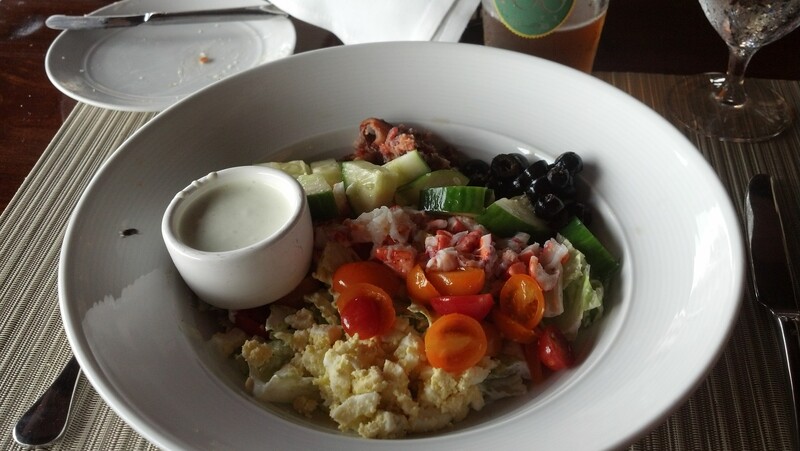 We had their “famous” Lobster Cobb Salad. Honestly, it was a very nice salad, but the lobster was limited and the price was outrageous. Of course, the view, the service and the ambience are what you are paying for, so the experience was worth the price – once. We also had dessert. (Oh, come on! We’re on vacation!) 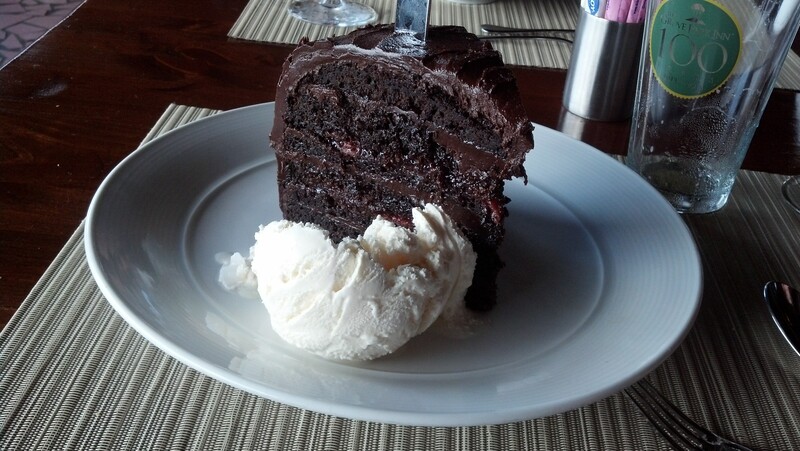 I ordered the chocolate cake with the cherry in-between the layers. It came with a generous scoop of vanilla ice cream. I’m sure that this is normally very, very good, but mine was pretty dry. I took most of it back to the B&B. 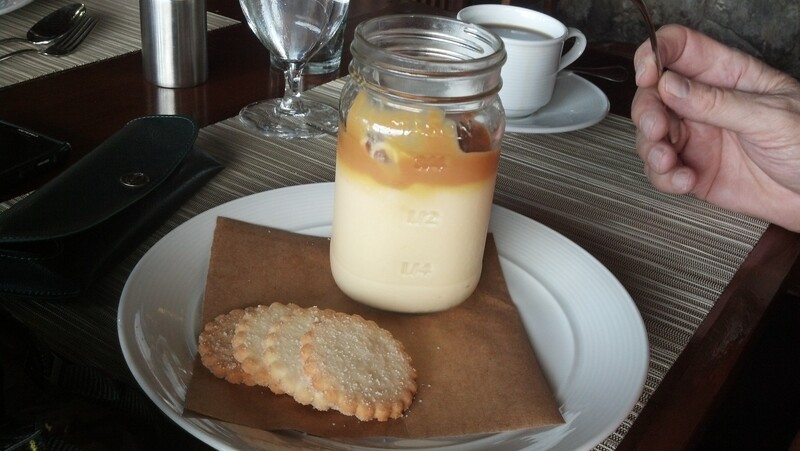 On the other hand, Jim had the butterscotch pudding (in a Mason jar – isn’t that novel) with caramel topping. He finished every last spoonful. There are all kinds of terrific shops in the Grove Park. 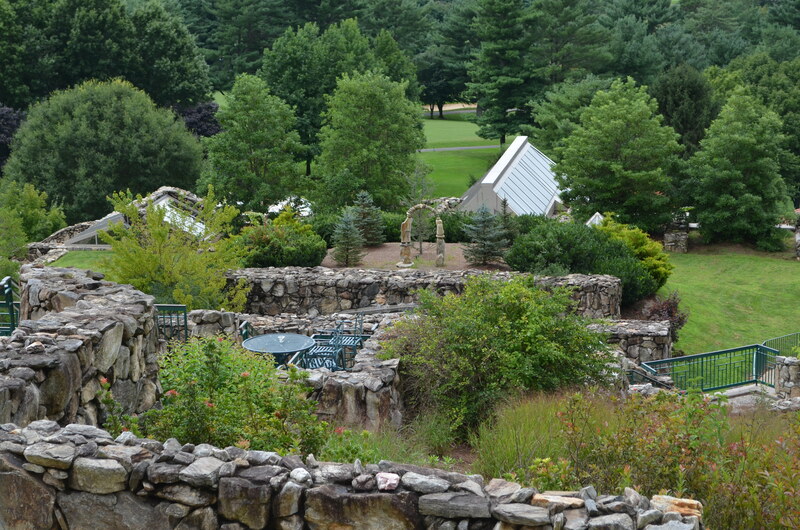 There are also conservatories, a grotto pool, and so many other sites that we didn’t even get a chance to see. We’ve decided that, some day, we will have to book a stay at the Grove Park so that we can experience it all. Our vacation started very early on Saturday morning, August 17. Before anyone worries, our pups were home with their very favorite baby-sitter (and my bestest friend), Chris. They were spoiled totally rotten. More about that in upcoming posts. 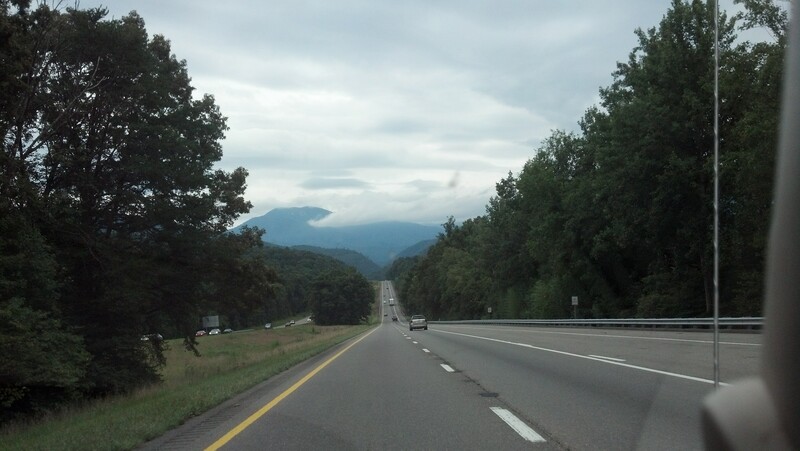 Even though it was rainy (actually throughout almost the entire vacation), our drive went very well. I’m blessed to have a husband who can drive long distances without complaining. We made only a few stops on the way down (the usual – gas, a Coke, grab a bite, etc.) I have to give props to XM radio. There’s something very comforting about driving 500 miles with the same radio station playing. It sure makes the trip go quicker. 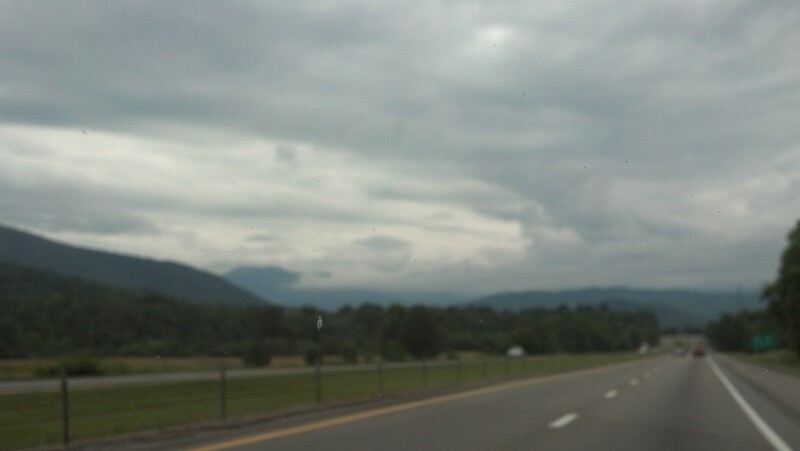 Here are the first views we got of “my” mountains (the Smokies) heading east on I-40. My heart really jumped up to see that sight. I guess it will always be in those mountains. When we lived in Atlanta, we made several trips to the Asheville area and had visited Biltmore House at least four times. Funny thing, though, we’d never spent any time at all in Asheville. After seeing several travel shows featuring Asheville, we were anxious to see what we’d missed all those years. A special treat awaited us in Asheville. 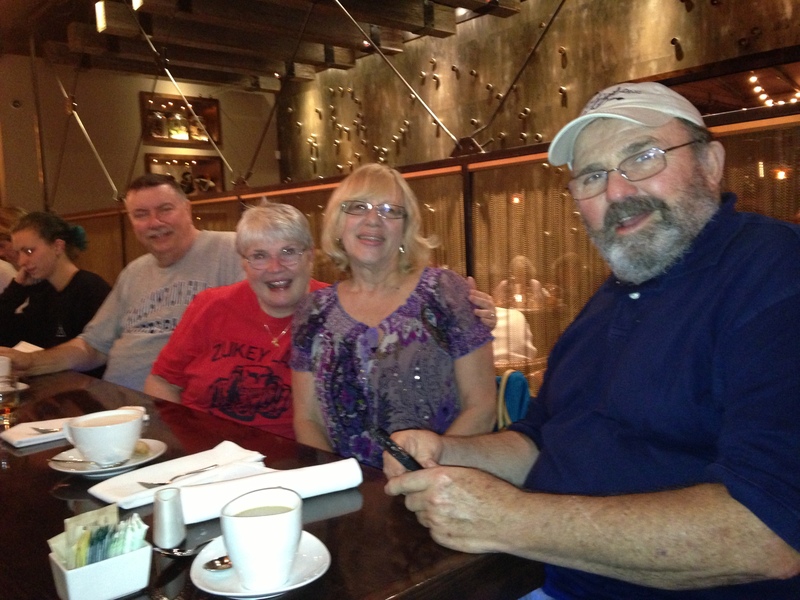 Our dear friends, Eric and Gloria, from Sharps Chapel, Tennessee (where we own some property) planned to meet us and spend a couple of days with us. We were thrilled that they were able to join us for several reasons, but mostly because we hadn’t seen them in several years and we so enjoy their company. Eric grew up in North Carolina and had spent quite a bit of time with his grandmother who lived in Asheville. 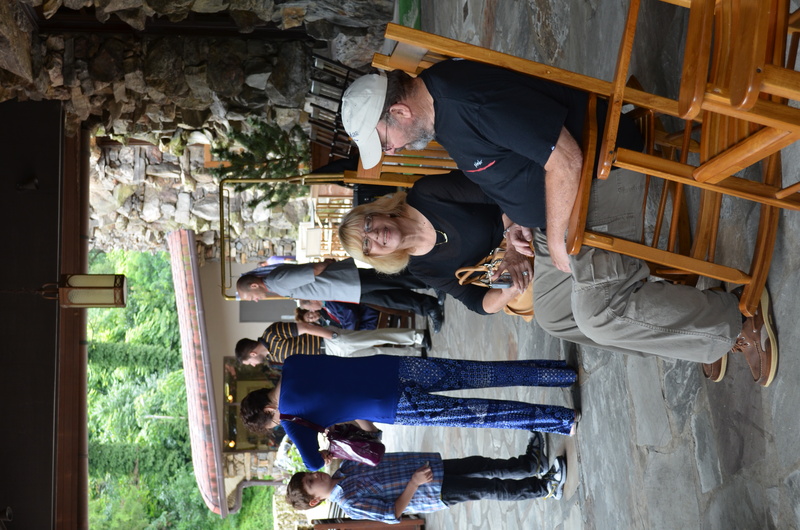 Eric and Gloria have, through the years, spent time in Asheville and know it quite well. They became our “unofficial” tour guides. The bluegrass gathering that had been planned for the neighboring venue was cancelled due to the weather. That was one of the reasons we had decided that Peck’s would be a good choice. We were sorry to lose out on the music, but it did give us several free hours in downtown Asheville. Asheville reminds me very much of European cities I’ve visited. Even in inclement weather, everyone is walking. It’s a really tough place to drive (narrow streets, odd layout, etc. ), but there are several parking structures around the center of town. If you’re going to Asheville, park and do what the locals do. Get out and walk. It’s a very easy-walking town. There are lots of shops and sights to see and many options to stop for a beer, a drink, or a meal. Another thing that was clearly evident is that Asheville is a very, VERY, dog-friendly town. Many of the local restaurants (including Peck’s Tavern) have outdoor seating in which your canine family members are welcome. There are even many stores which will allow you to bring your well-behaved buddy inside with you. Gotta love that! We walked around a little more until the rain started back. That sent us scurrying to our car and back to the B&B. It had been a long day, but a really good one. After checking in to see how the dogs were doing, we fell asleep to the sound of rain. Ahhhhh! I was “home” in North Carolina again, and it felt wonderful! Are you kidding me??? 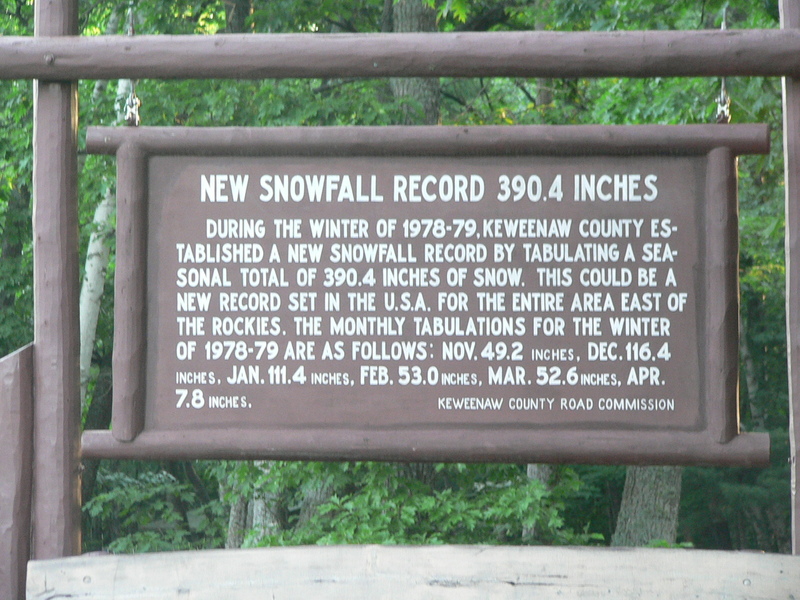 A record three-hundred-and-ninety-point-four inches of SNOW???? I did the math. 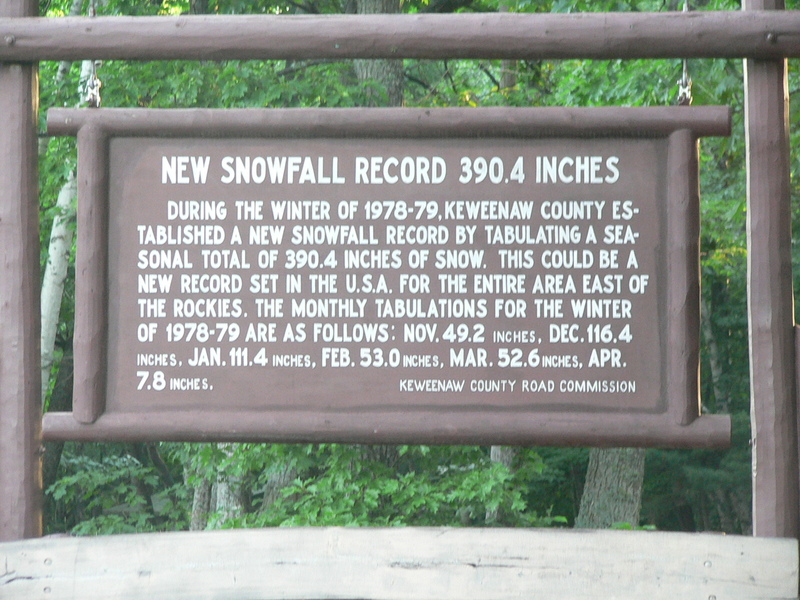 That’s over 32-½ feet of snow in one season. As much as I love the Keweenaw, winter there would not be for me (or Jim, either). 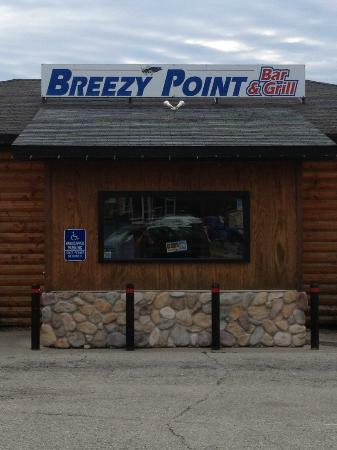 If y’all ever decide to go to Escanaba and want to try out the really, good burgers at Breezy Point, I strongly suggest trying to sit outside. The views are really nice. If it hadn’t been record heat, we’d have opted for those tables, too. We headed for our B&B. The Kipling House is actually in Gladstone, Michigan, but it’s close to Escanaba and we are so very glad that we chose this place to stay. As a matter of fact, there’s so much to tell you about this place that I’m giving it a complete post of its own. That will be the next one – the last in the installments of WIDMSV. We set out to explore Escanaba. Most of you won’t have gotten the “In Da Moonlight” reference. Jeff Daniels (yes, THAT Jeff Daniels) is a native son of Chelsea, Michigan. Chelsea is a near-neighbor to where Jim and I live. Jeff Daniels wrote a comedy (play/movie) “Escanaba in Da Moonlight,” about Yooper hunters. 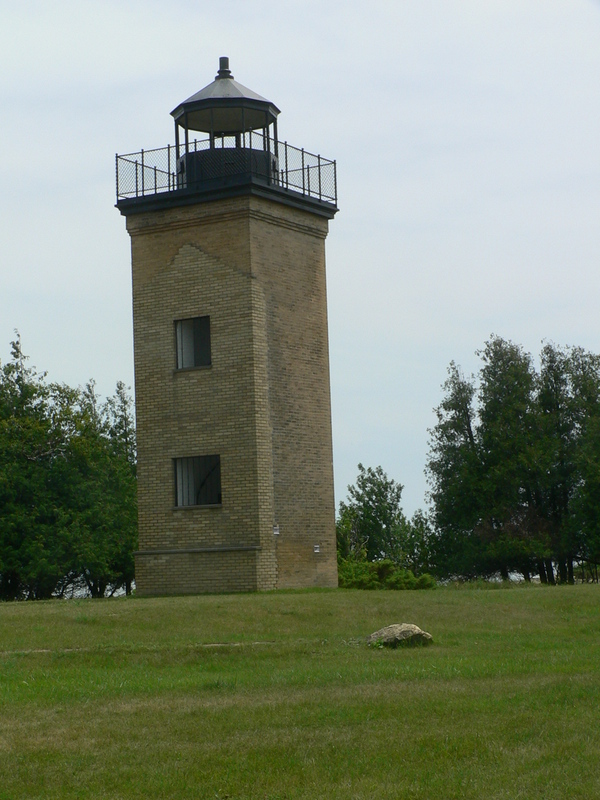 He has quite a knowledge of Escanaba because his wife is originally from the town. We were lucky enough to catch Jeff Daniels in his one-man show, and he is absolutely hilarious. What a wit! Anyway, we decided that we needed to check out Escanaba. Escanaba is a nice town. It seems, to me anyway, more like a Lower Peninsula town than others we’ve been to in the UP. Perhaps it’s the close proximity to Wisconsin that makes it “feel” different from the others in the area. For dinner the first night, we went to The Stonehouse (http://www.stonehouseescanaba.com/Home.html ). The restaurant came highly recommended, and we know exactly why. 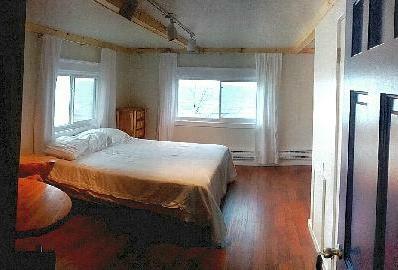 Even though it’s going through some major renovations on the outside, the interior was calm and attractive. Service was friendly, yet professional. I had grouper (my very favorite fish) Panko-breaded topped with lobster and shrimp veloute. Jim had the “great lakes platter” (broiled whitefish and walleye with beer-battered perch. It was a delicious and enjoyable meal. We’d definitely go back. 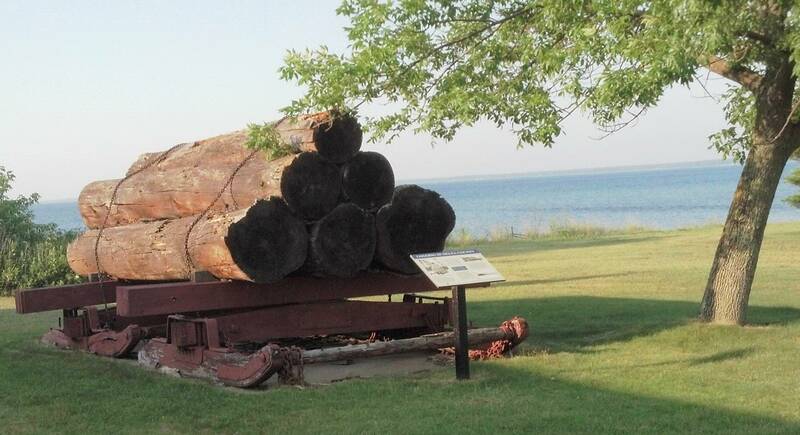 and this pile of logs (representative of the millions of board-feet of lumber harvested in the Upper Peninsula and sent to build America). 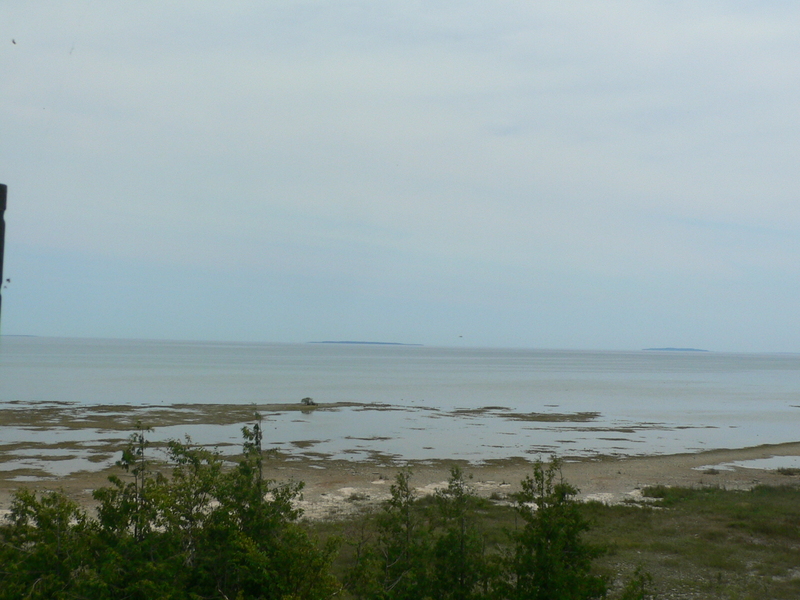 The next day, we went birding on the Stonington Peninsula. We were still in search of the illusive boreal species and this was our last chance this trip. Come to think of it, we didn’t even hear the first loon calling. Now THAT’S disappointing! We birded all along 28 Rd! We got great looks at Red-eyed Vireos (they were everywhere), PeeWees, Red-breasted Nuthatches, Yellow-rumped Warblers, Black-throated Green Warblers, Hermit Thrush, American Redstarts, Yellow-bellied Sapsuckers, Ravens, and a silent empid. Still, no boreal birds, but it seemed everywhere we went, there were deer of all ages, sexes and sizes. From 28 Rd (they have some strange road names up there), we headed down to the boat launch area where there was a gorgeous log home. There we saw an American Bittern, several Common Yellowthroats, Red-winged Blackbirds, and one Black Tern. We continued on to tip of the peninsula. There’s a tower that might be a good spot to look for wading birds, but the flats were conspicuously free of any form of bird. Needless to say, we were pretty disappointed, but we really weren’t there in a good “birding” time of year. We decided to call it a day. The trip home was coming up and we were hot and tired. It was time to start winding down. We went back to the B&B (remember, a whole post on this next time) to clean up, pack, and get ready for our trip home. We went to Hereford & Hops for dinner. The restaurant is right on the main street in Escanaba. I must say that the beer was really, really good. The food (walleye) was, too, except the service was incredibly (and I do mean INCREDIBLY) slow. It was early on a Friday night and the place was still pretty empty. We really wonder how they manage when it starts getting busy (or if it actually does get busy at all). We even had difficulty getting our beer (and they’re a brew pub). It was a wonderful trip. I have become a huge fan of the UP! I’ve heard my sister-in-law, Kathy, talk about it for years and how much she loves it up there. I knew that I would – for the same reasons, but you can’t imagine how amazingly beautiful it truly is. 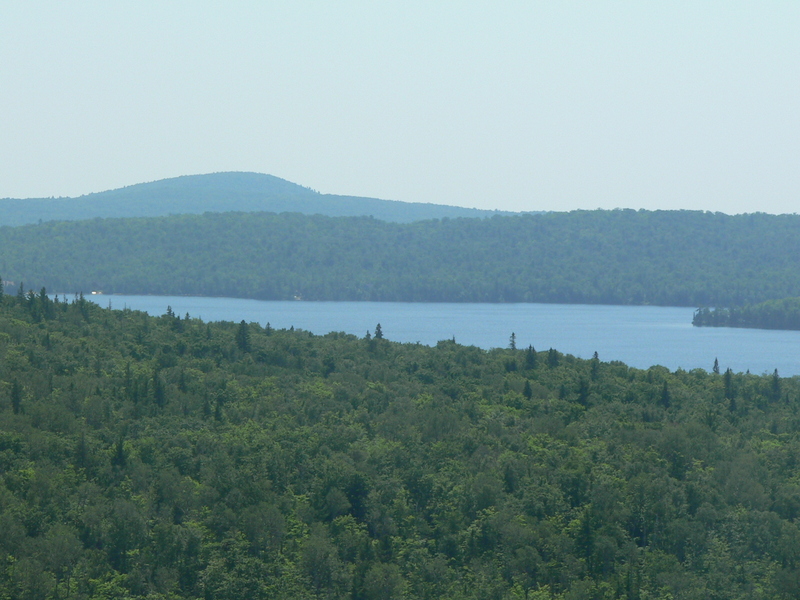 There are so many areas that we weren’t able to visit (the Porcupine Mountains, especially). We’re already talking about our next trip. I think late spring might be an excellent time (as long as the snow is gone). There’s something special about a holiday in a smaller town. It’s especially nice when it’s Independence Day and the weather is sunny and clear. We spent the day in Copper Harbor and the evening at the Eagle River Inn. It was so much fun. We started the day going for breakfast in Copper Harbor. The place we had intended to eat wasn’t opening for breakfast that day, so we went to another restaurant, The Tamarack Inn. The service was spotty (which is somewhat understandable on a holiday), but we could tell they were trying to please. I had the fritter, French toast. AWESOME! Didn’t think I’d have to eat again for a week, though. We watched the remainder of the parade (which, sadly, we missed most of). What we did see and hear was the fire department with their engines all decked out with flags and bunting, people on bikes, people walking down the street all dressed up in red, white and blue, and others with their dogs in costume. It was a hoot! How, clearly, Americana is that? 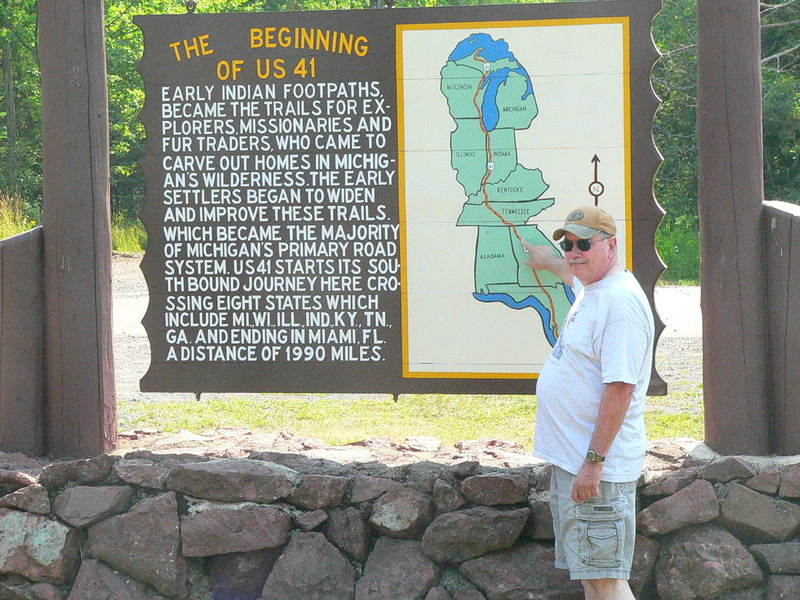 From there, we drove up to the spot where US 41 starts! US 41 is a highway that has been nearby for a large part of my life. I grew up in St. Petersburg, Florida. Not far from there is where US 41 becomes the ‘famous’ Tamiami (Tampa to Miami) Trail. It also runs through Georgia very near where Jim and I lived for so many years. 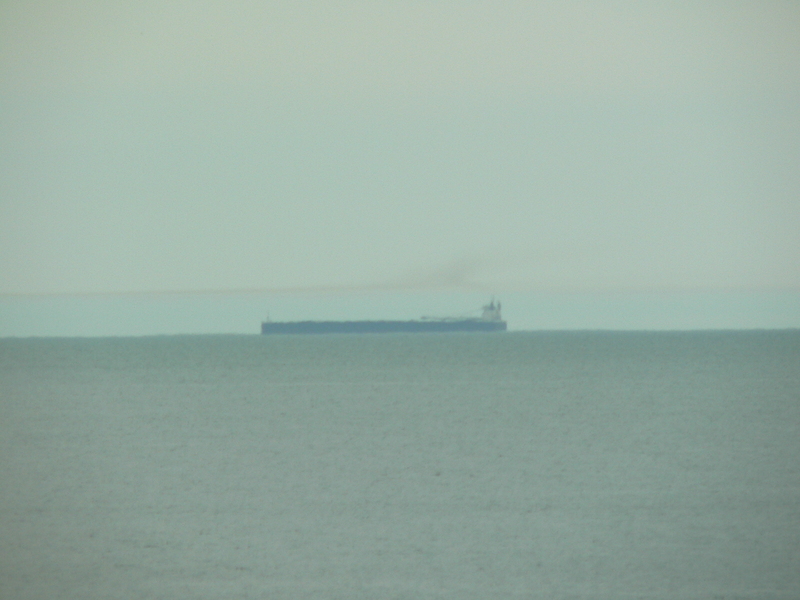 As you can see from the photo, it runs from the very tip of the Keweenaw all the way to Miami, Florida. We also got a wonderful surprise while we were taking photos of the sign. 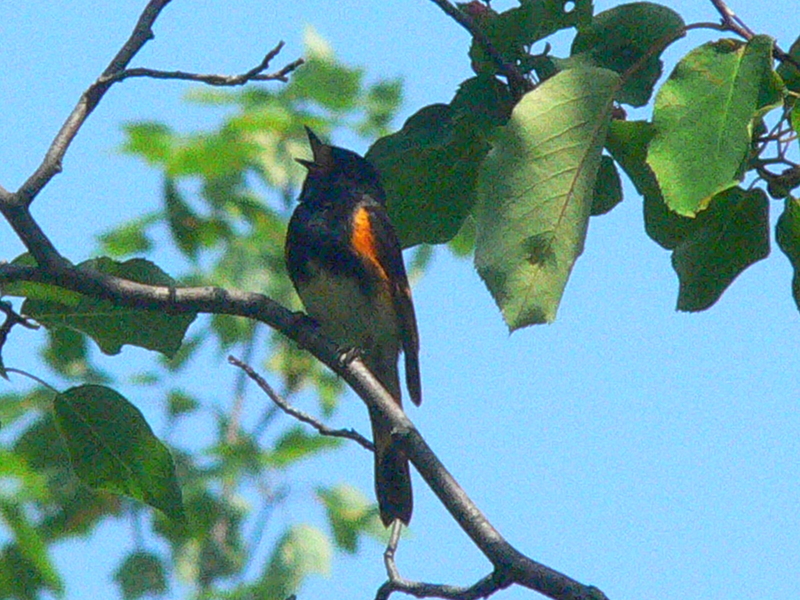 A male American Redstart was singing very close by. Before we knew it, he popped into view. Right after that, a Northern Parula started calling from just across the road. We waited and, sure enough, he flew right overhead and continued singing. I guess it’s never too late to look for ‘love’ in the Keweenaw. 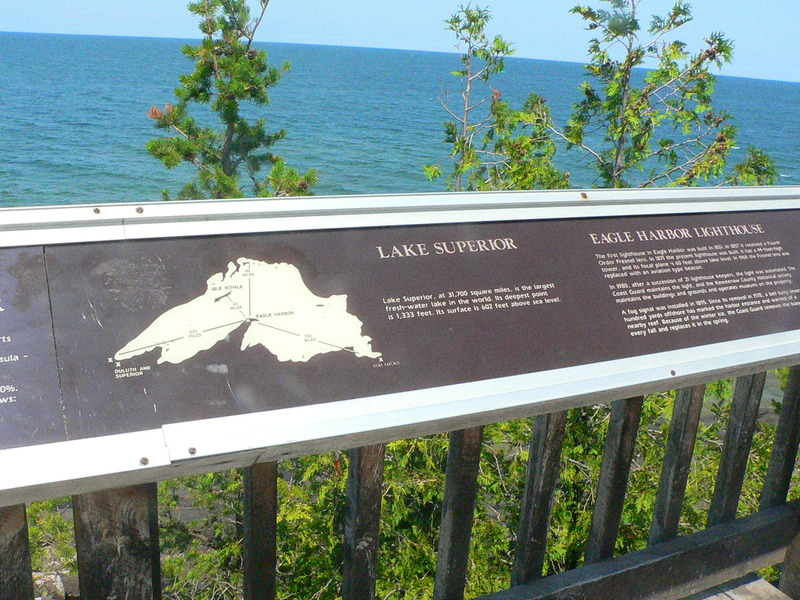 From there, we headed back south (well, honestly, there isn’t much further north we could go without being in Lake Superior). We stopped at an outlook where the Eagle River flows into the Lake. Such a beautiful spot! 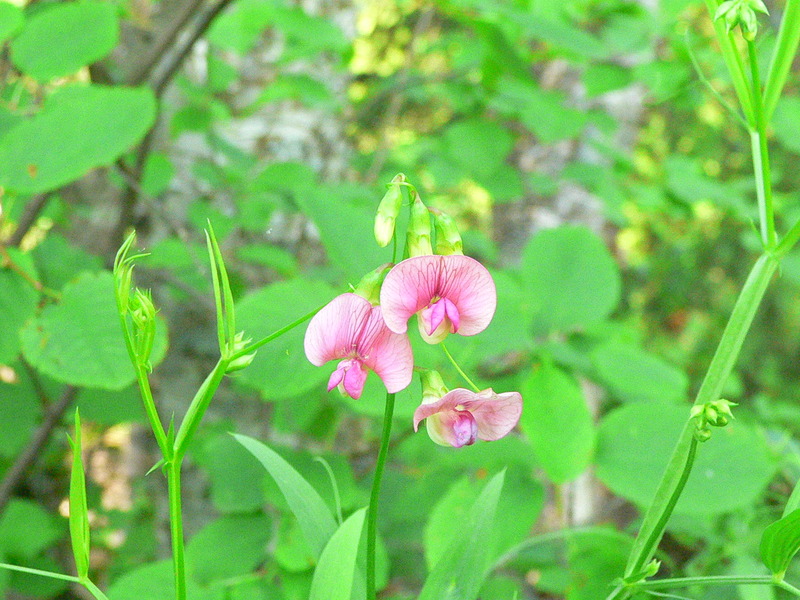 There were some really gorgeous flowers growing right by the river. I just had to take a photo. Then we walked out onto the rocks and saw some spectacular lake views. Walking back up to the car, we saw this male American Redstart singing away. He was right over head and didn’t move when I focused my camera on him. 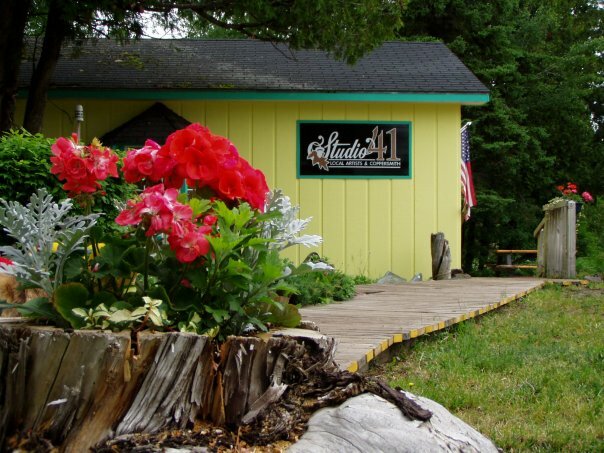 Then we headed to Studio 41 (http://www.studio41copper.com ). What a fabulous place! It was hard not to buy everything in the shop – well, except for the price tags. Thing is, they represent several local artists as well as the works of the owners. One of the items we bought was this gorgeous copper bracelet. The photo really doesn’t do it justice, and my almost constant wearing has dulled the shine to a lovely patina. 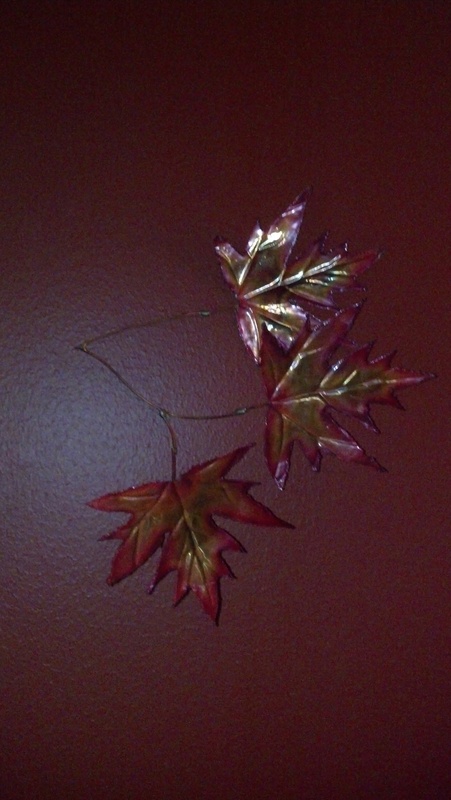 Another purchase are these fabulous maple leaves! They have these sculptures in many sizes, but this spray is just perfect for the location on one of our smaller living room walls. 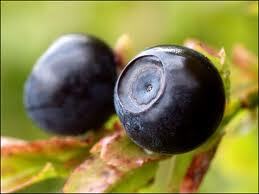 After that, it was off to The Berry Patch once again. 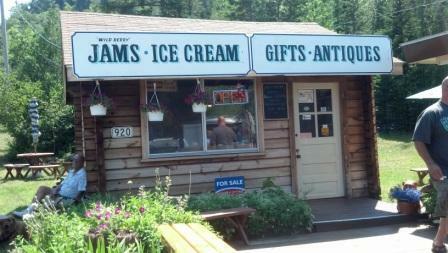 We enjoyed our ice cream so much the day before, we just had to go back. Of course, there’s something intrinsically American about ice cream on the 4th of July. In honor of George Washington (well, not REALLY), I had the tart cherry sundae. What a treat! The sweet, smooth, velvety vanilla ice cream with the tart cherry preserves… HEAVENLY! And, here, I’d thought I wouldn’t have room after breakfast. I guess it must have been all that walking in the fresh air. 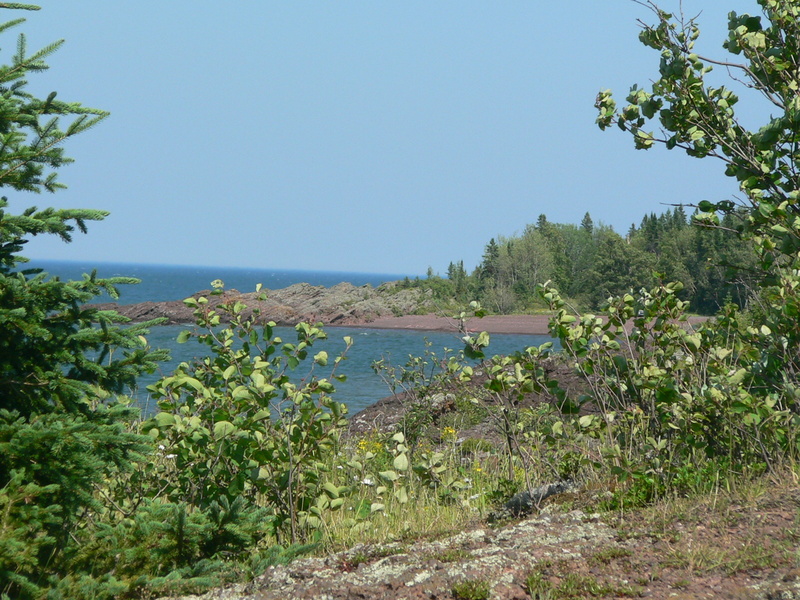 We took the drive along the Lake Superior shoreline. This is such a gorgeous drive. 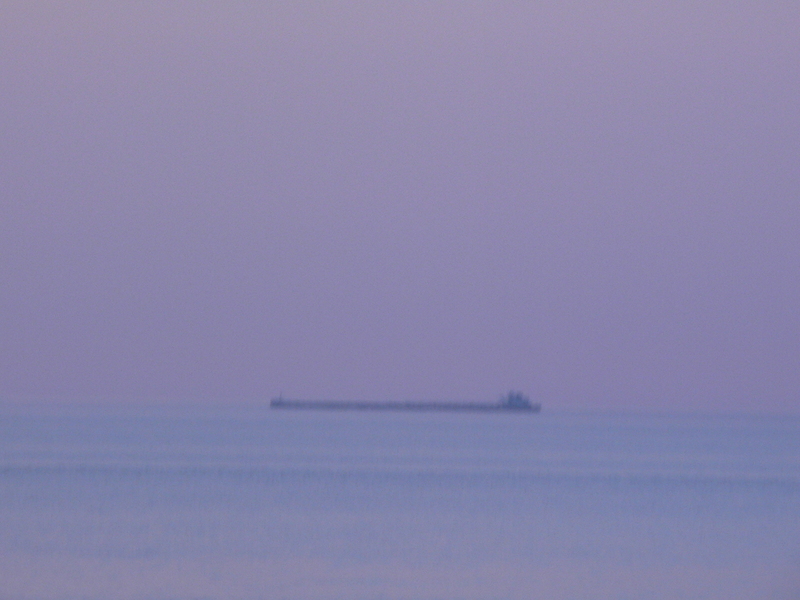 The day was clear and, once again, the lake was flat and calm. I would love to have the time to paint all the beautiful views. 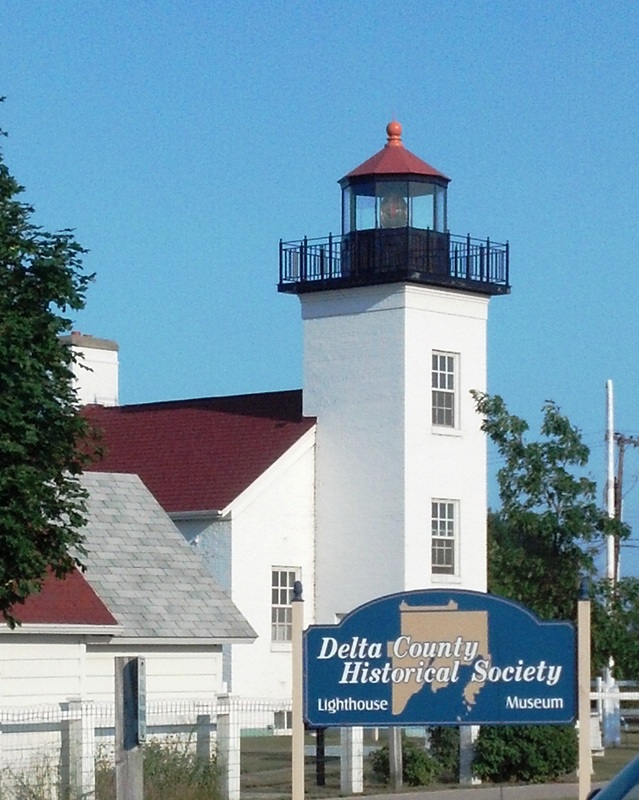 We stopped along the way at yet another lighthouse. 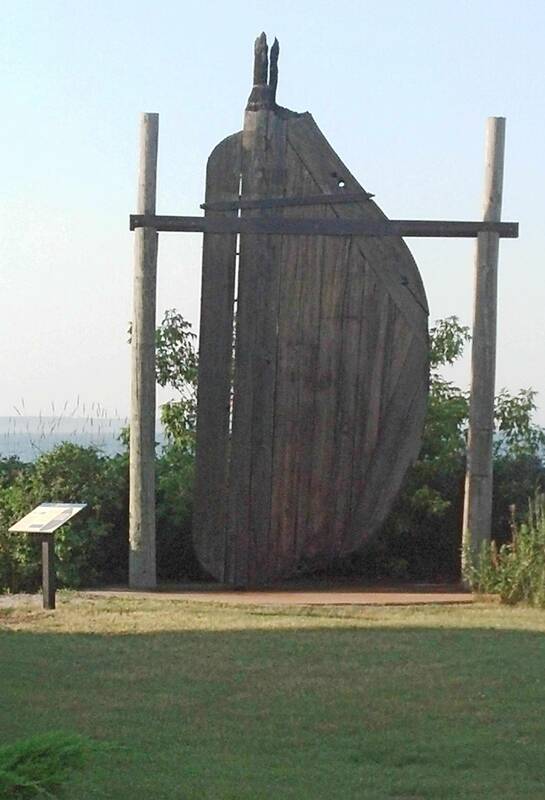 This was in Eagle Harbor. 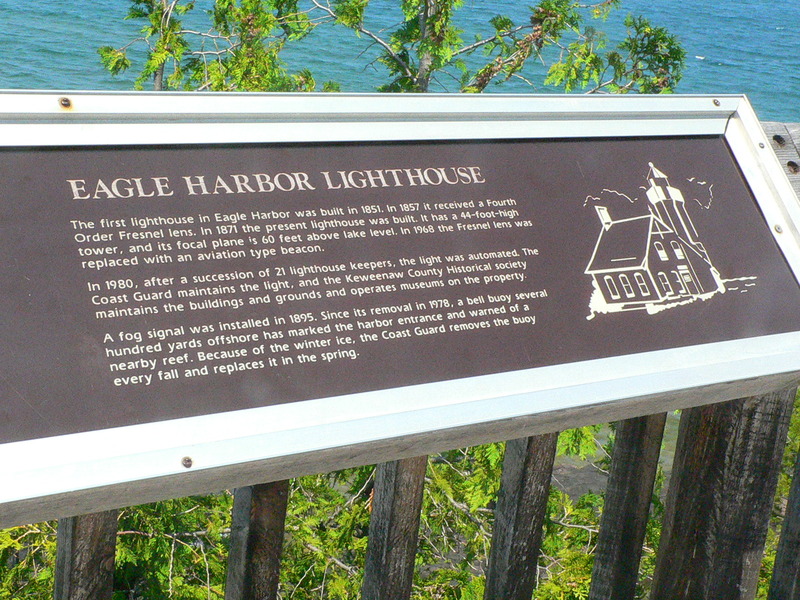 They had built an observation deck with these informational plaques. I thought they were very interesting. 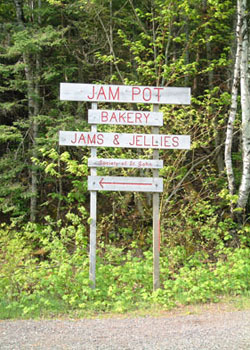 Just where the road curls away from the shoreline you come to The Jam Pot (http://www.societystjohn.com/store/ ). They are a Catholic Monastery of the Byzantine rite. The monastery bakes amazing breads, cakes and cookies, but we were there for the jam. What jam it is! They have so many varieties that it is virtually impossible to list them all, but we made sure that we bought bilberry and thimbleberry. They also have a full line of sugar-free jam. Right next to The Jam Pot is Jacob’s Creek Falls. 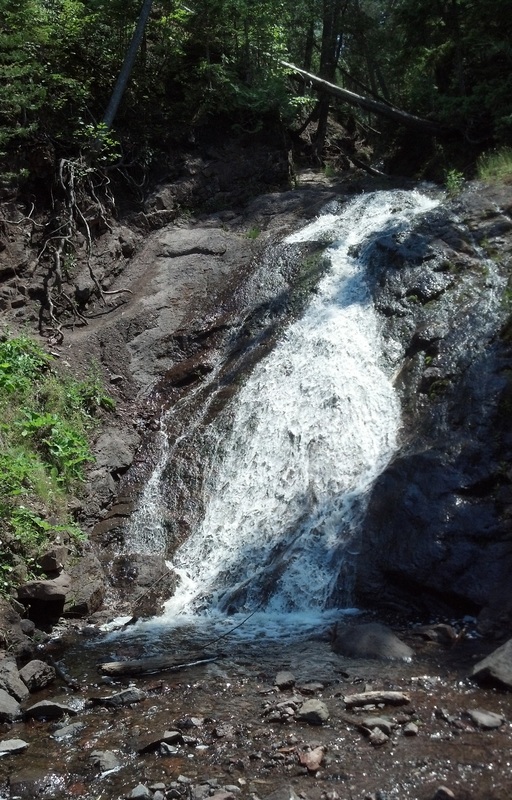 It’s so nice to find such a pretty waterfall so easily accessible. Even though it had been a drier than usual summer, the falls had plenty of water and it was so nice to enjoy the cool air and listen to the sound of falling water on rocks. Once back at the Eagle River Inn (http://www.eagleriverinn.com/ ) we dropped off our purchases and headed down for the barbecue. That smoker that they built sure puts out some delicious que! A great pulled pork sandwich and a beer? That says Independence Day to me! We headed out to the beach to stand in the water and enjoy the company of new friends. There were a couple with their parents from Minnesota there. They also had two of the funniest, most friendly dogs (a Weimaraner and a German Shorthaired Pointer). We had a grand time visiting with both humans and canines. 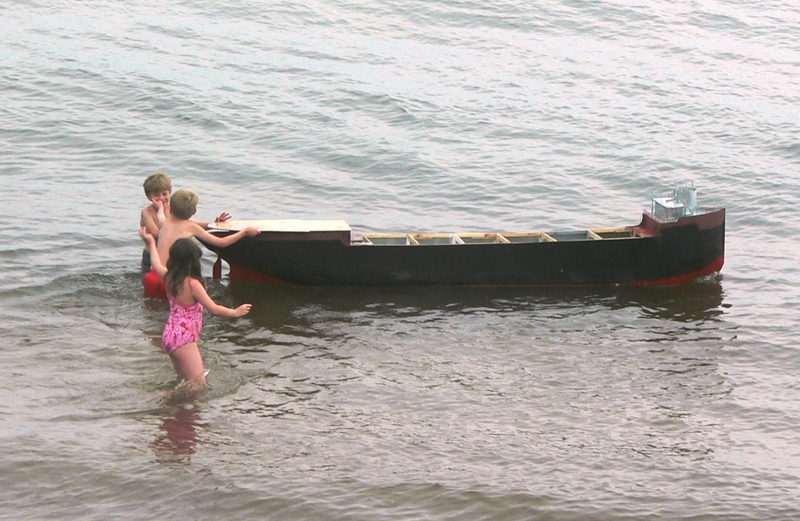 A group of children came down the beach with their own version of a Lakes freighter. 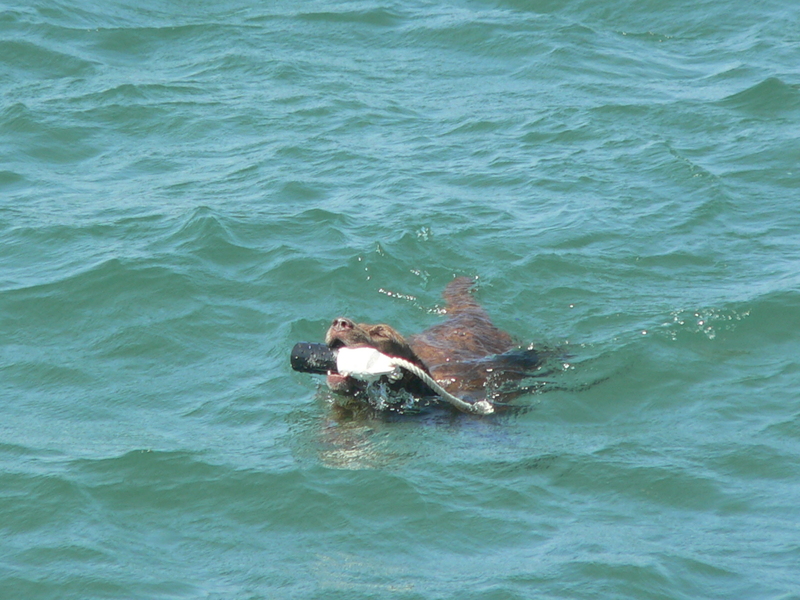 Interestingly enough, there was the life-sized version out on the lake at the same time. We were really enjoying our evening waiting for the band to set up and the fireworks that would begin around 11 p.m. That was until a big storm blew up! 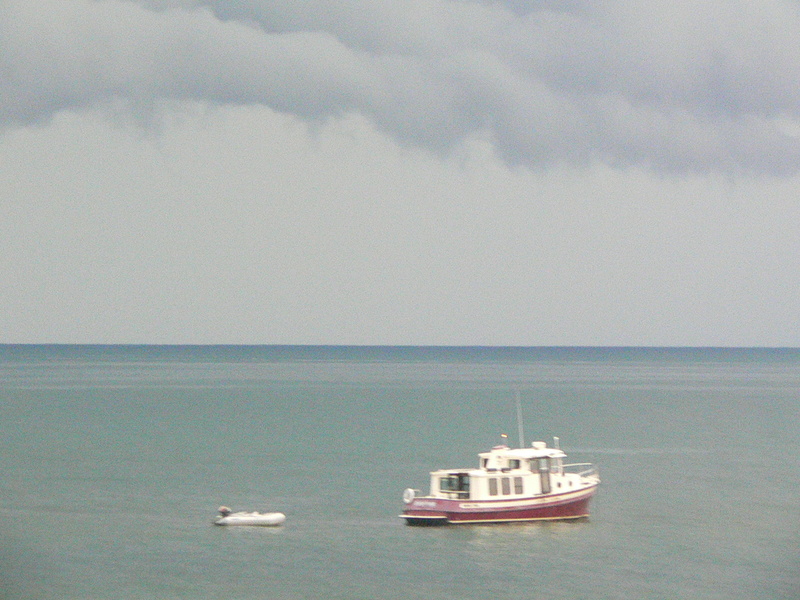 There was a small boat that had come to anchor off the Inn to enjoy the band and the fireworks, but he had to head off in a hurry to beat the oncoming rain and wind. Mother Nature had her own fireworks in store for us! I thought the tent that had been set up for the band was going to end up in Wisconsin, but some brave souls held on until the storm eventually passed. By this time, we were up in our room and had decided to call it a night. We figured that they’d have to wait until another night for the fireworks and we were leaving in the morning. We should have had more faith in the hardiness of the partiers. Sure enough, around midnight, the storm had cleared out and the fireworks were set up. The band had not stayed, but they had radio so the party continued and the fireworks went off. We really had an excellent view from our room as we faced the beach. 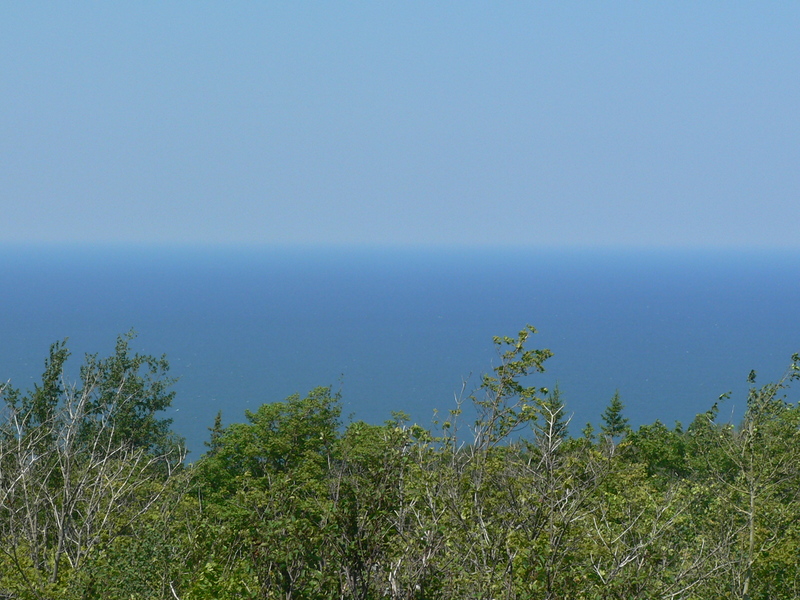 I was a little sad that we weren’t staying longer in the Keweenaw. I know that we will definitely come back. 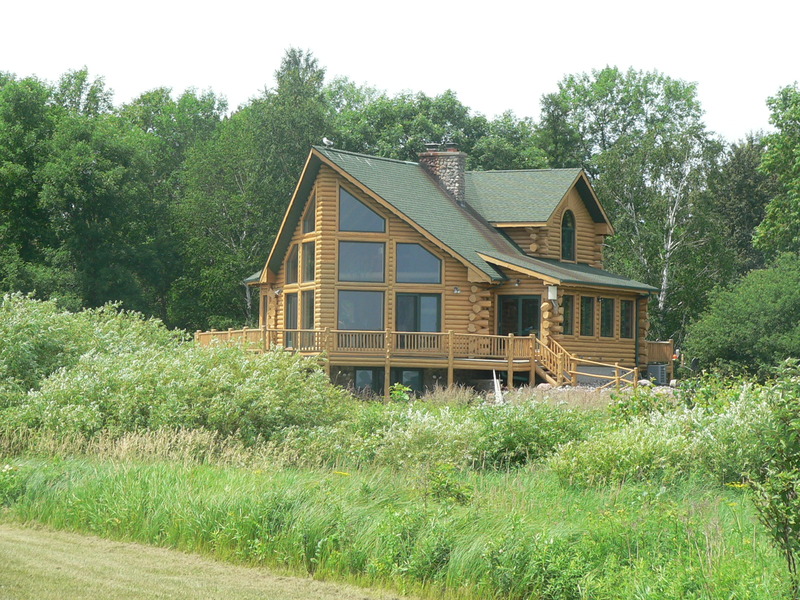 We will absolutely make reservations at The Eagle River Inn, and – this time – we’ll be able to bring our “kids!” One thing I can pretty well assure you of, is that we won’t be doing our travel to the Keweenaw in the winter. We saw this marker on our way south. 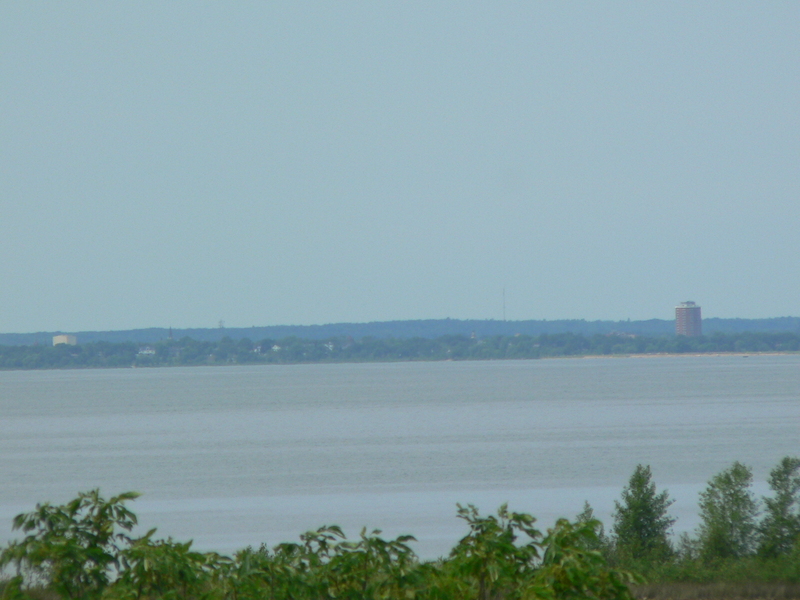 We reached the upper parts of the Keweenaw Peninsula expecting cooler weather. Unfortunately, the ‘weather gods’ didn’t get the memo. It was in the mid-90s! 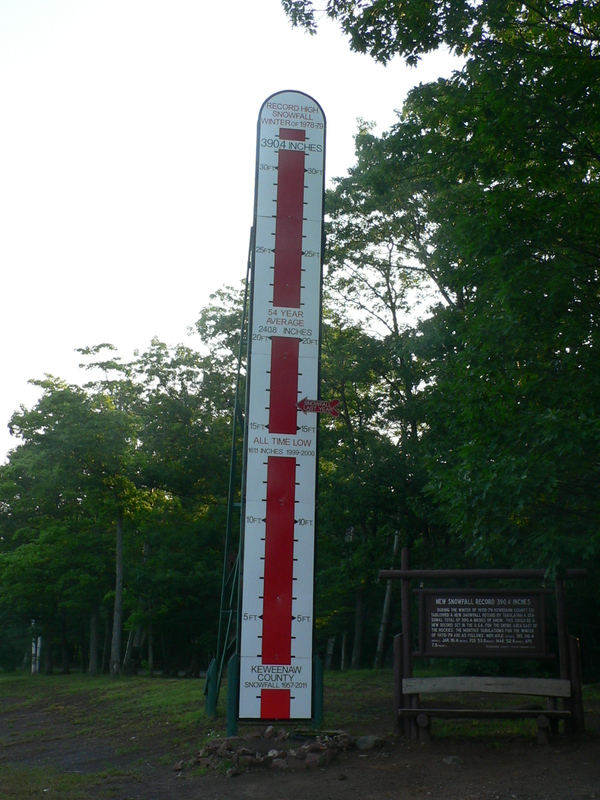 Again, it’s not SUPPOSED to be that hot in the Keweenaw. For the most part, they don’t have air-conditioning. They usually don’t need it. Phew! We checked into our room at the Eagle River Inn (which was so clean and newly refurbished, we could still smell the fresh paint). 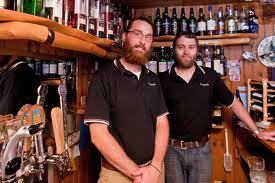 The Eagle River Inn has been a labor of love for Mike and Marc (the proprietors). 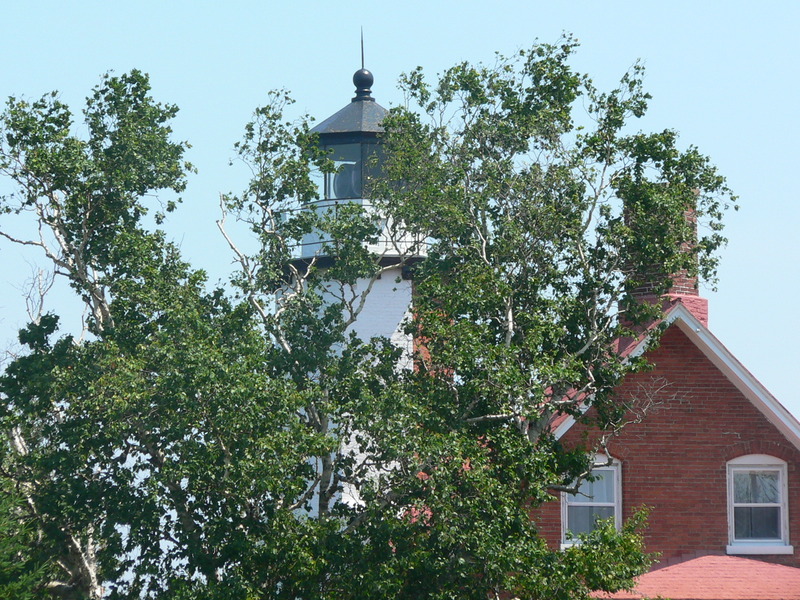 They have spent every penny they could come up with on fixing up this wonderful inn which is only steps away from one of the prettiest, most accessible beaches in the Keweenaw. Their attention to detail is amazing. They have turned this location into a comfortable, friendly, destination inn that we will look forward to visiting over and over again. Did I mention that the Eagle River Inn is DOG FRIENDLY??!!!! They are! I believe that the future of inn-keeping is in pet-friendly accommodations. More and more, people consider their pets integral parts of the family. The idea of leaving a family member behind in a kennel or alone at home is troubling. A key to enjoying a family vacation is for the WHOLE family to enjoy the time together. I really have to commend The Eagle River Inn for being so forward thinking. 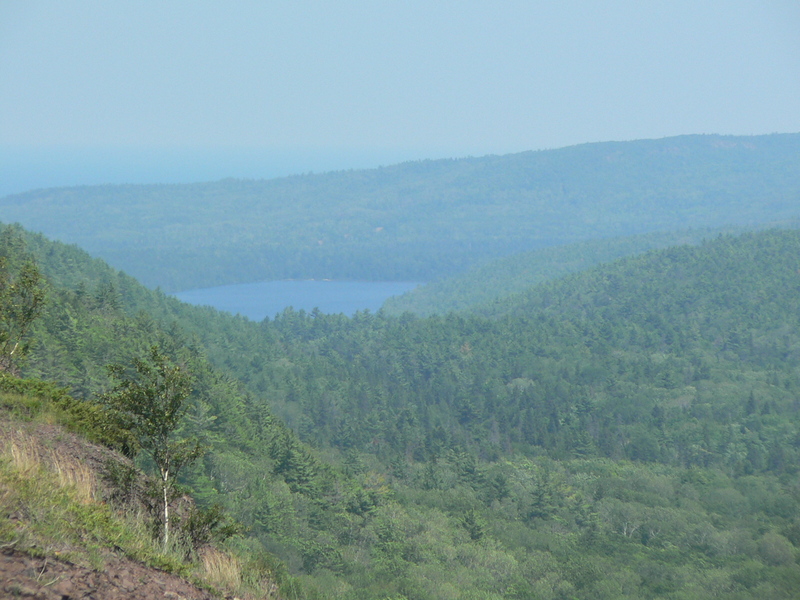 I have read that there were plan to put a cell tower on Brockway Mountain. 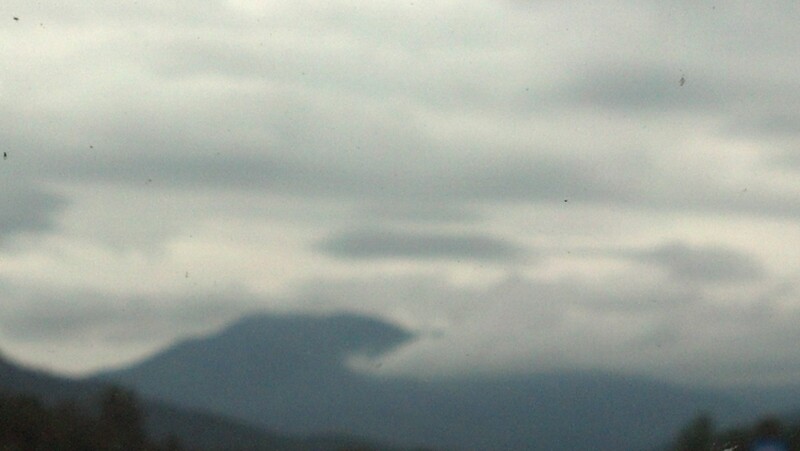 (Okay, y’all, this wouldn’t be considered a “mountain” in the south – well, except maybe Florida. In Michigan, however, this is surely a “mountain” as the glaciers really scraped most of the state flat.) It is the highest point around and I understand the need for communications, but I certainly hope that they figure something else out that won’t mar the beauty of this amazingly pristine area. As we reached the end of the road, we found ourselves just a little ways from the Wild Berry. 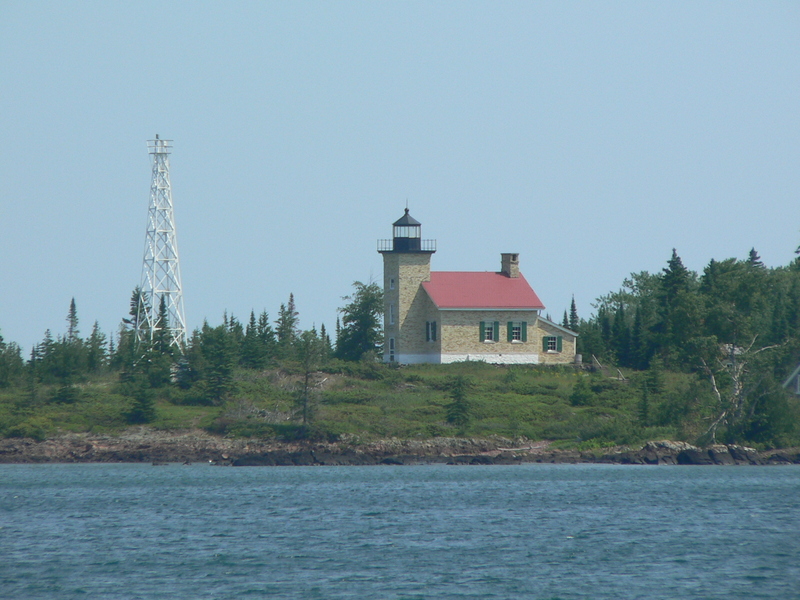 I had found out that one of my high school classmates had grown up in Copper Harbor, Michigan. She and her family (the Nousiainens) had owned and run the Wild Berry Ice Cream store. Her brother, George (who had been a few years ahead of us in school), had moved back to Copper Harbor and was still running the store. I opted for thimbleberry. 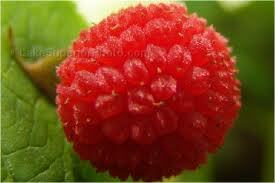 A thimbleberry is related to raspberries. It’s a delicious, tart fruit with LOTS (and I do mean to capitalize that) of seeds! It’s absolutely delicious, but the pips… I tend to think they’re worth dealing with. All I can tell you is that we both thoroughly enjoyed our sundaes, and it was great to be able to visit with family of an old friend. We immediately made plans to come back the next day for more camaraderie and, of course, more ice cream. By the time we finished our ice cream and said good-bye, we were getting pretty worn out. It had been a very long day starting with birding (and getting eaten alive) in the morning and lots of driving in the middle. We decided to head back to the Eagle River Inn, grab some dinner, and try to get some sleep. 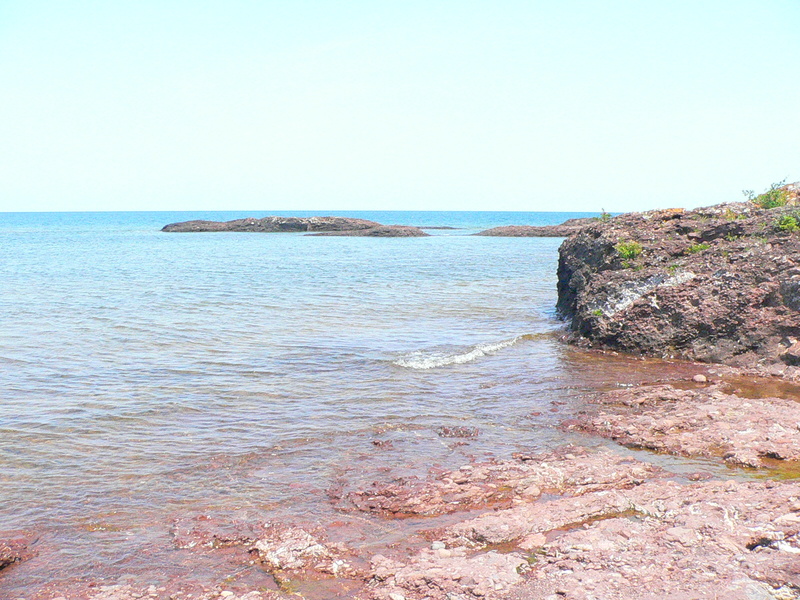 The road that we took back south followed the shoreline of Lake Superior. What a gorgeous place this is! We stopped at a couple of outlooks along the way. At one, there was a couple who were tossing a ‘duck’ out into the Lake for their chocolate lab to fetch. 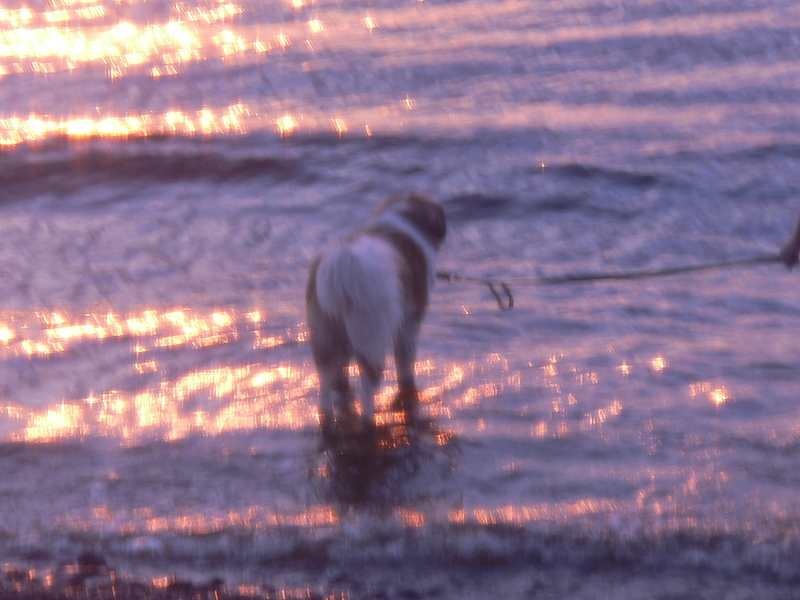 We enjoyed watching the dog swim out again and again (obviously enjoying his game), retrieving his prize, and returning it to his people. We wanted to make certain that we got back to Fitzgerald’s (the superb restaurant at the Eagle River Inn) for our dinner reservation. The special was smoked prime rib! They have a huge smoker in the parking lot of the Inn. It smelled so wonderful when we left that we wanted to be sure not to miss out. We were rewarded handsomely! That was one of the finest meals we’ve had in a while. The meat was smoked to perfection and the accompaniments were excellent. Jim had a smoked-fish appetizer. I tried it, but I decided that I’d save the room for dinner. I did, however, have a nice ‘Bookers.’ I must make a special note of the tremendous variety of whiskies that Fitzgerald’s stocks. Whether it’s bourbon or scotch whiskey that float your boat, they probably have your brand – or a brand that you’ve been wanting to try. They also have an excellent selection of whiskies from other parts of the world (Canadian, Irish, even Japanese). After eating a huge meal, and the long day, we were ready for a good night’s sleep. This was the first time it really occurred to me that we were much further north. At 11:00 p.m., it was still light (and still HOT)! 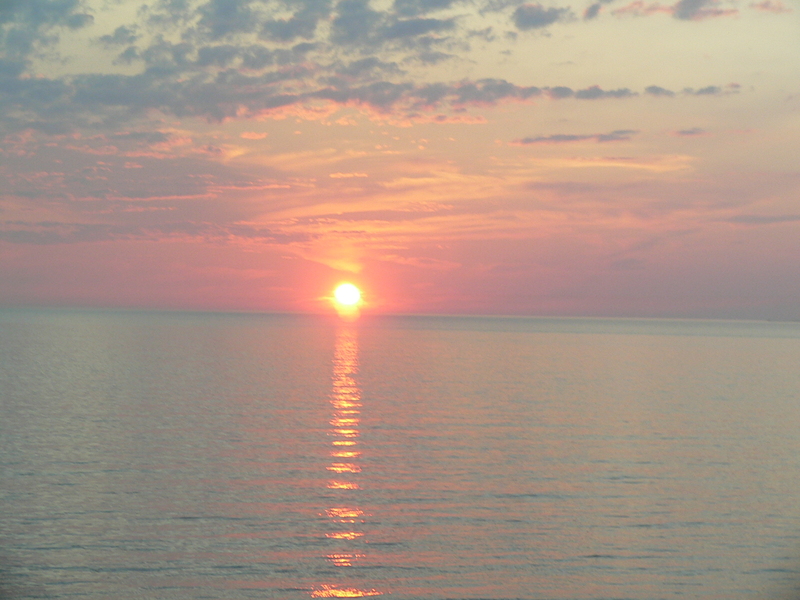 After snapping several photos of the amazing sunset and a late lakes’ freighter, I finally drifted off to sleep. Tomorrow is the Fourth of July! I figured I wouldn’t be getting much sleep at all then. After spending a couple of hours birding the Pesheekee Grade, we were ready to eat. 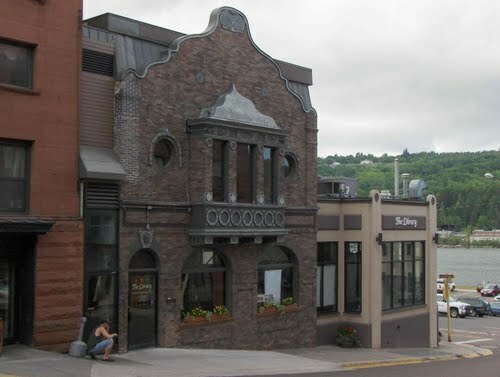 There really isn’t any place to eat breakfast in the Michigamme area that we could find, so we headed on to Houghton. As much as I would have loved to visit the KBC brewery, it really wasn’t a prudent place to consider for breakfast. The first restaurant we attempted to go to had been highly rated, but we opted out after a really poor experience. I am not going to name the establishment in my blog, because my southern heritage always taught me that, if I couldn’t say something nice – say nothing at all. Besides, even mentioning it here is giving it more attention than they gave us. 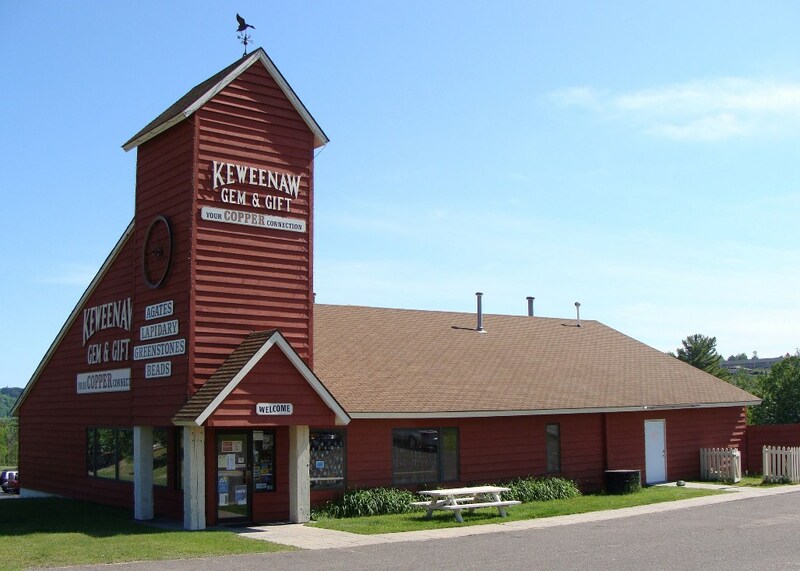 We felt so much better after a good meal that we decided to stop at Keweenaw Gems and Gifts (http://www.copperconnection.com/) to see what kind of wonderful stone and metal arts we could find. What a ‘dangerous’ store. There were so many wonderful treasures, we had to really narrow down our focus. Once again, we could have totally blown our budget. We did make a couple of purchases. 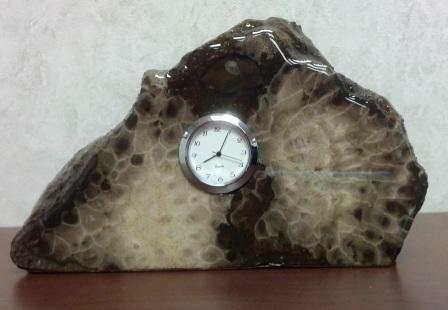 One was this lovely polished Petoskey Stone (Michigan’s State Stone) clock for Jim’s desk at work. 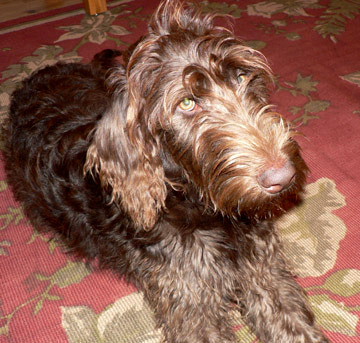 I just have to mention Lily, the Labradoodle. Lily comes to the store with her people. She’s the ‘official’ watch dog. Once she actually meets you, she’s a terrific ‘hostess.’ What a fantastic dog! We also purchased some gifts for friends. I just LOVE getting my Christmas shopping done before the Fourth of July! Look at all the Treasure! From Houghton, it was on to Eagle River. 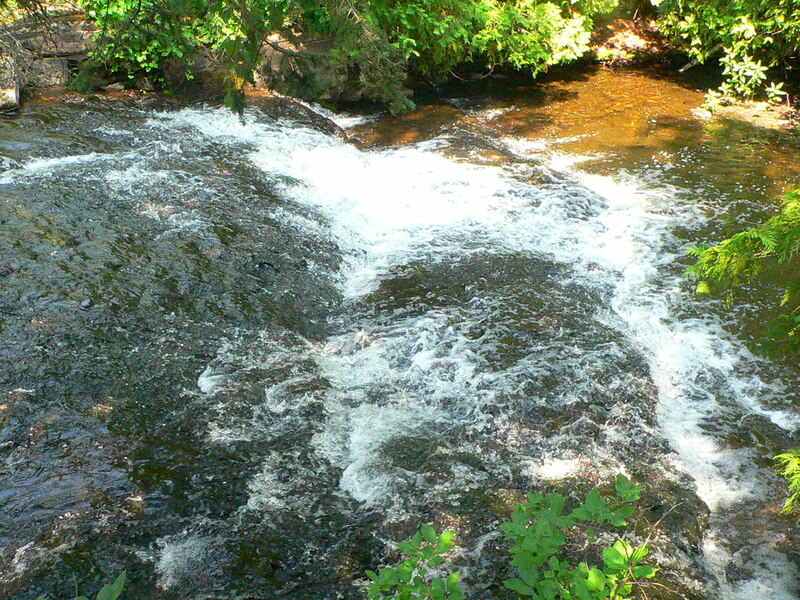 Eagle River is on the western coast of the Keweenaw peninsula. Our destination was the Eagle River Inn http://www.eagleriverinn.com/. We had read interesting reviews of the inn and I had written to the new owners and was very favorably impressed by their positive attitudes and their obvious desire to provide a terrific experience for their guests. 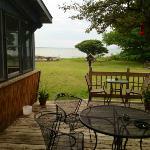 The Eagle River Inn is right on the beach. It’s only a few steps from the deck to the water. It’s especially nice because the beach there is nice, stone sand and the water is clear and the bottom is that same sand. Many places on the lake are rocky which makes it difficult to get to the water. It’s even harder when the rocks are covered with vegetation. (I wonder if we noticed more of that due to the extraordinarily hot weather or if it’s a symptom of invasive, non-native vegetation I’ve been reading about.) 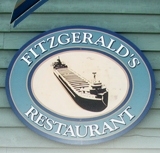 I will be writing more about the Inn (and their terrific restaurant, Fitzgerald’s) in coming posts. I’ll say right now, though, that I wish we’d scheduled more than two nights at the Inn. 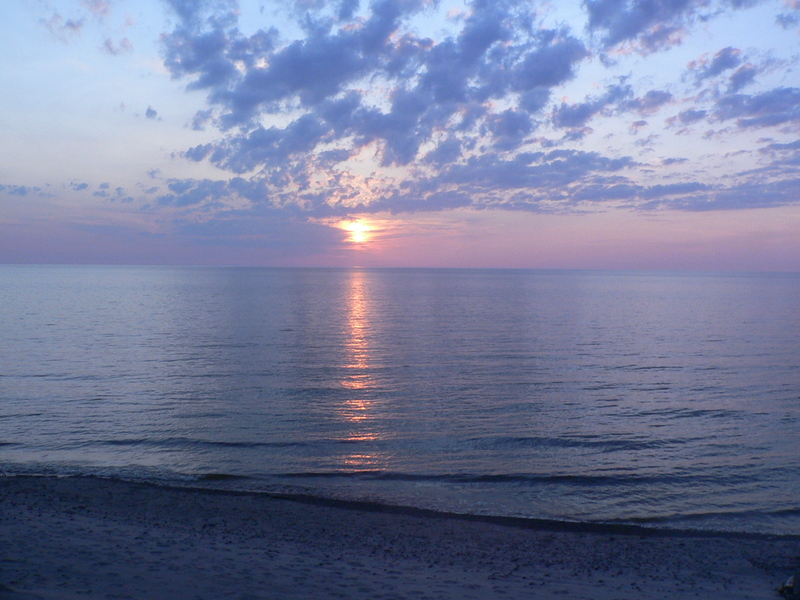 Here’s a photo of a sunset we saw our first night. The sunsets there are so breath-taking, you’ll undoubtedly see more photos of them in coming posts. Looking forward to “seeing” you here on Colmel’s Blog.